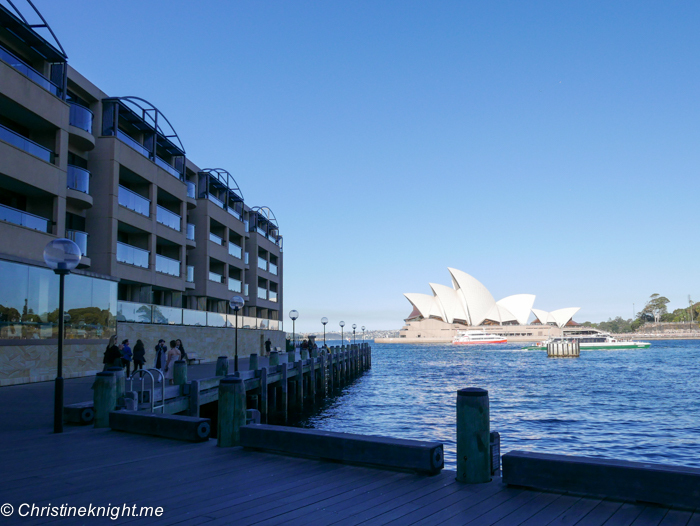 The Rocks Archives - Adventure, baby! 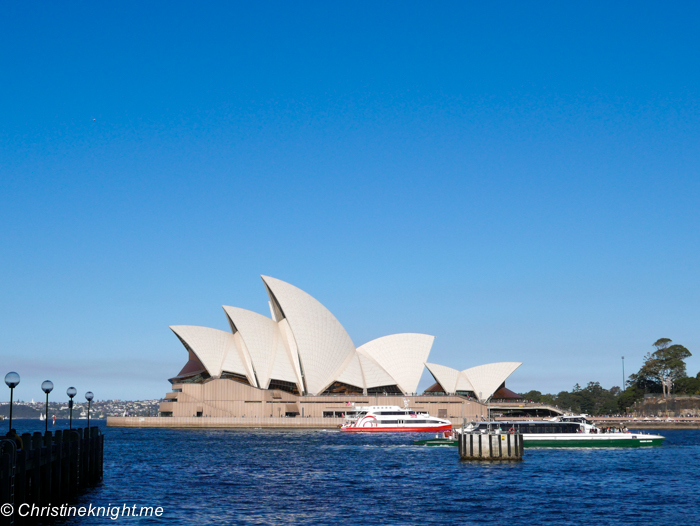 Oh la la it’s a fancy outing today! 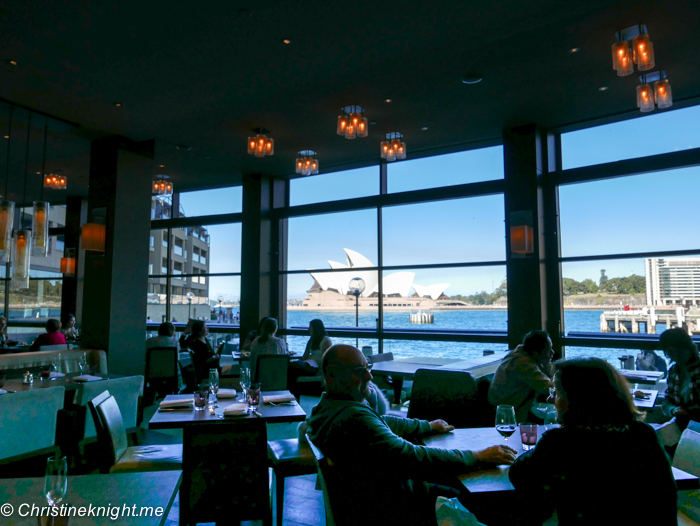 It’s off to the classy Shangri-La Hotel Sydney in the Rocks for a very pink high tea with friends. 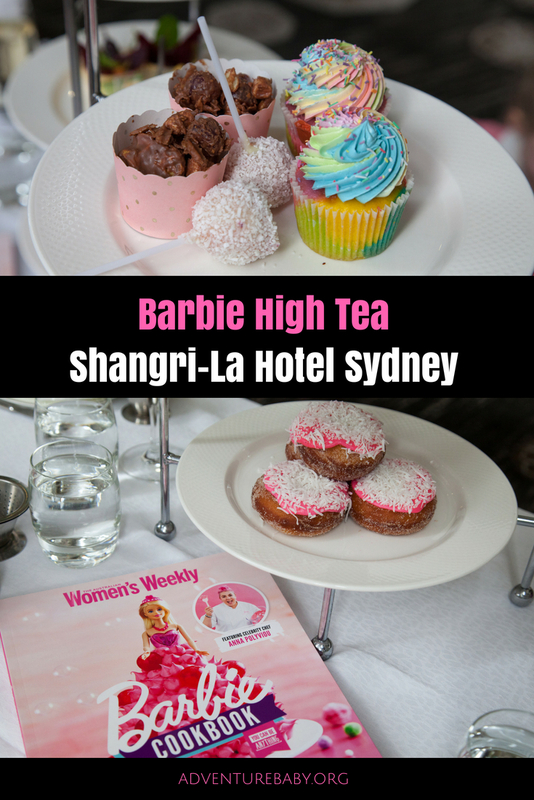 From June 15 – 29 2018, the Shangri-La Hotel Sydney is hosting a very special Barbie High Tea, created by their executive pastry chef, Anna Polyviou. 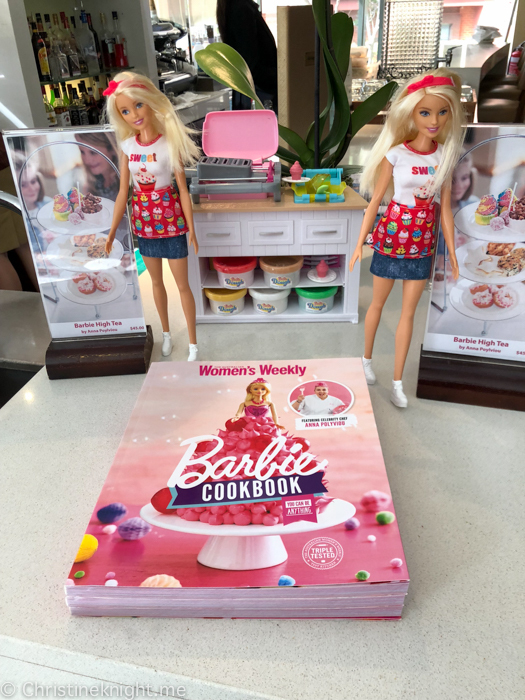 Anna Polyviou is often called the Punk Princess of Pastry, and with her bright pink mohawk she is the perfect poster girl for a new Barbie cookbook, which Polyviou has created in collaboration with the iconic Barbie brand and The Australian Woman’s Weekly. 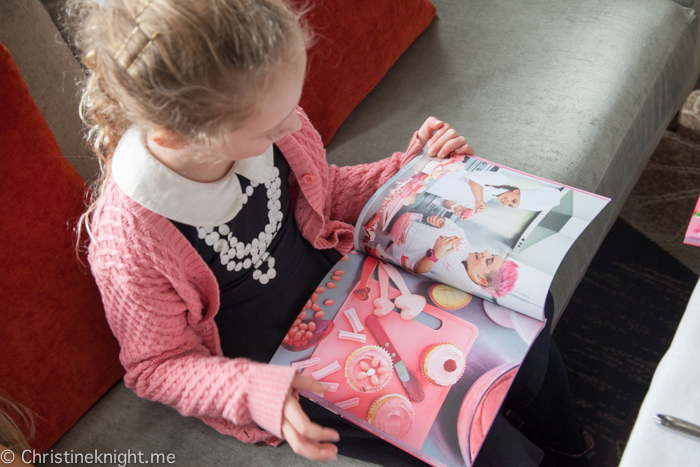 The cookbook is a fantastic edition to a young chef’s collection, containing a combination of recipes that range from simple enough for kids to do either on their own or with help from adults, to some harder ones that definitely need adult intervention, but that are so imaginative that they will inspire kids to create their next birthday party around the designs. 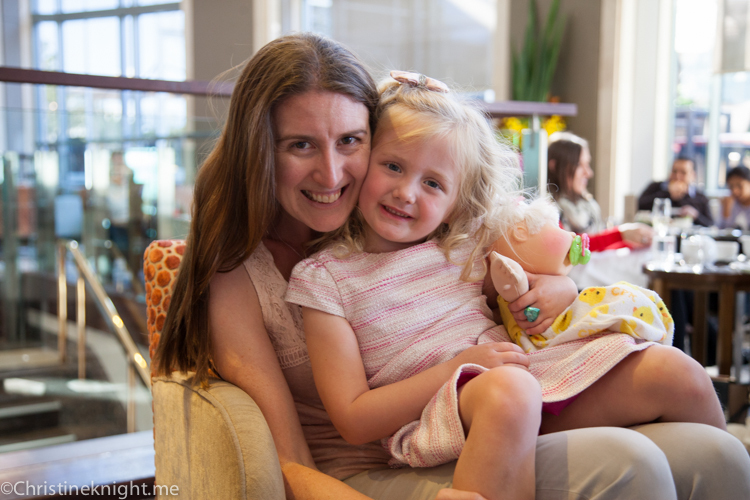 Our young Barbie (and Anna Polyviou!) 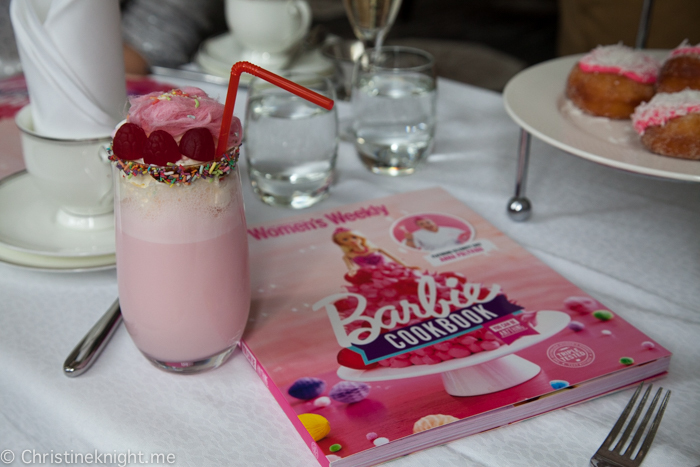 fans were keen to try some of the special recipes, which are reflected in the Barbie High Tea. 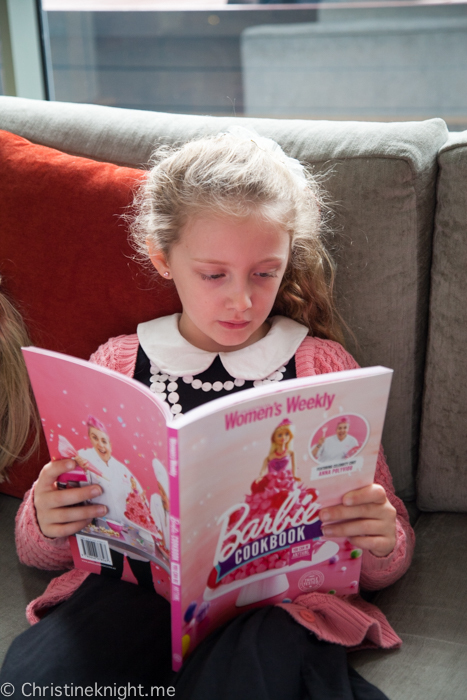 Each young guest is given their own Barbie Cookbook to take home, which our three discerning diners perused eagerly while waiting for their tea, choosing which recipe they would try at home first. 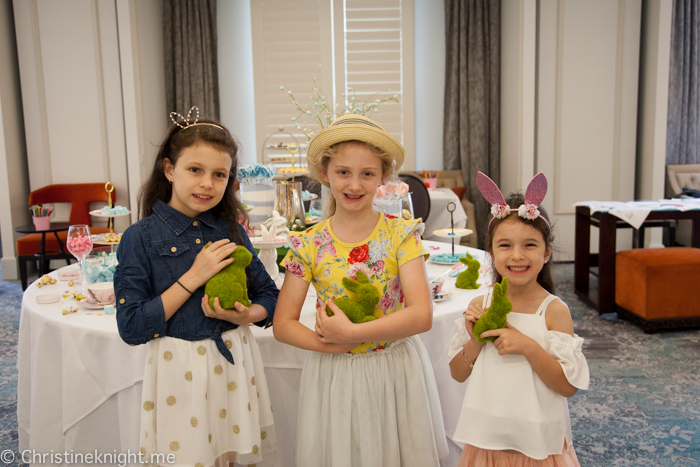 High teas are best experienced with friends, and for this special Barbie outing, we invited our usual high tea accomplices, with whom we’ve been sampling sugary treats in fancy frocks for quite a few years now. 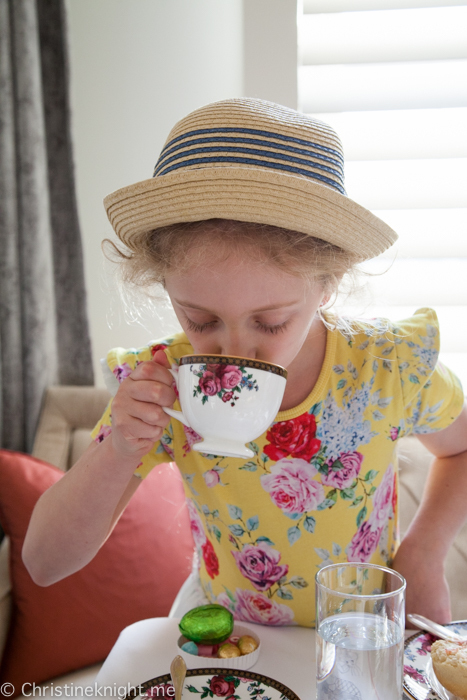 There is something so special about getting dressed up and having tea in delicate china cups that little girls just adore, and it’s a really wonderful occasion for both us mums and the kids. 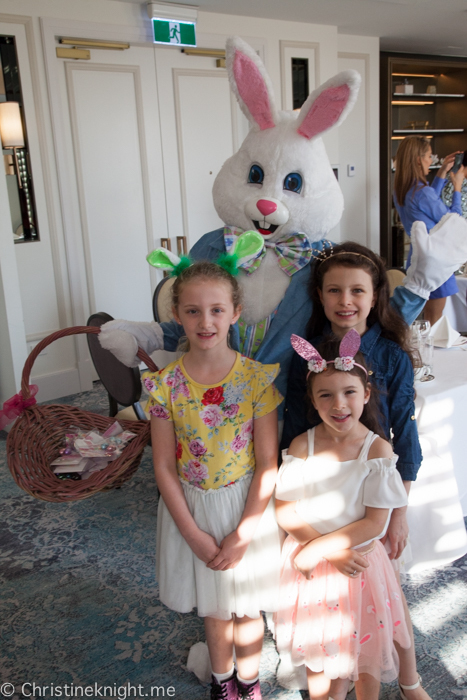 The three-tiered silver stands arrived quickly, brimming with so much pink that the girls’ eyes popped out of their heads. 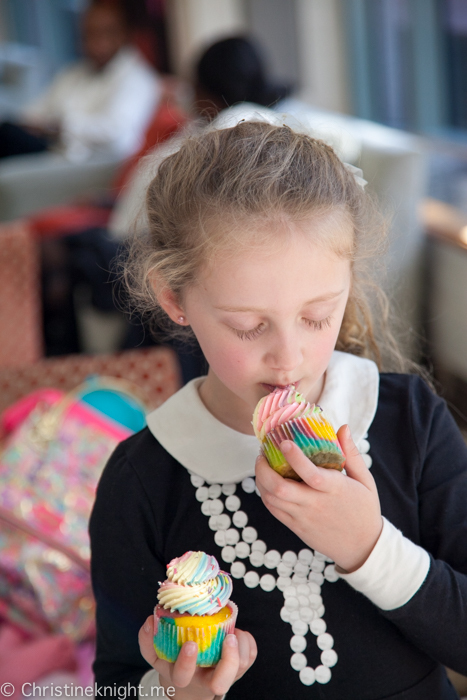 It’s clear that Polyviou knows her target audience well, and the creative, beautiful AND delicious menu was 100% on pointe with this young audience who are drawn to all things pink and sparkly. 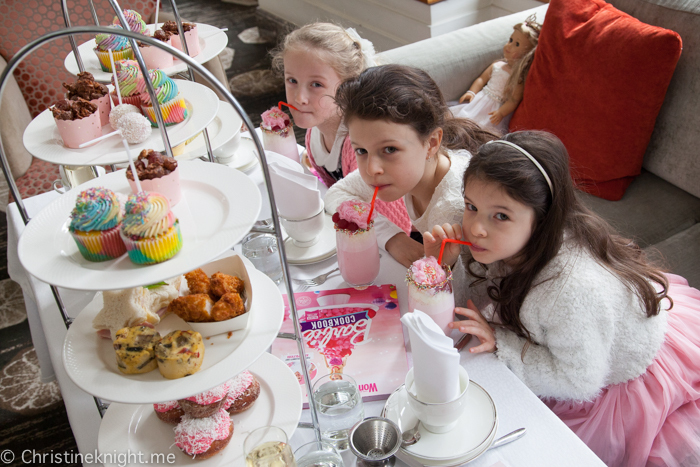 Adults and kids can both order the Barbie high tea. 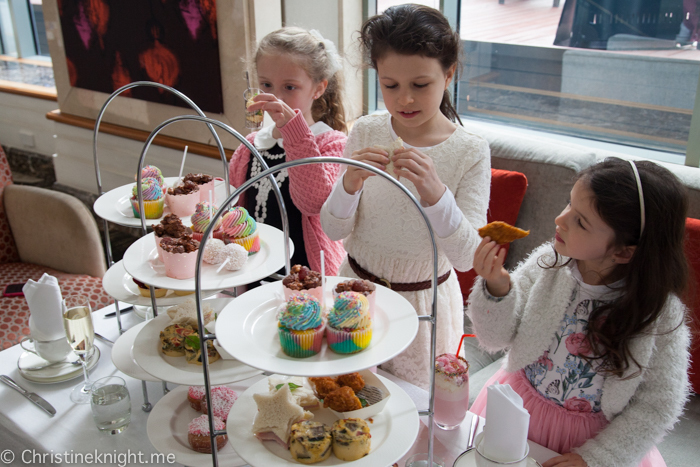 If you’re dining with a few other adults or kids however, you might want to consider ordering the Barbie tea for the kids and the traditional high tea for the adults, and then trying a bit of everything! 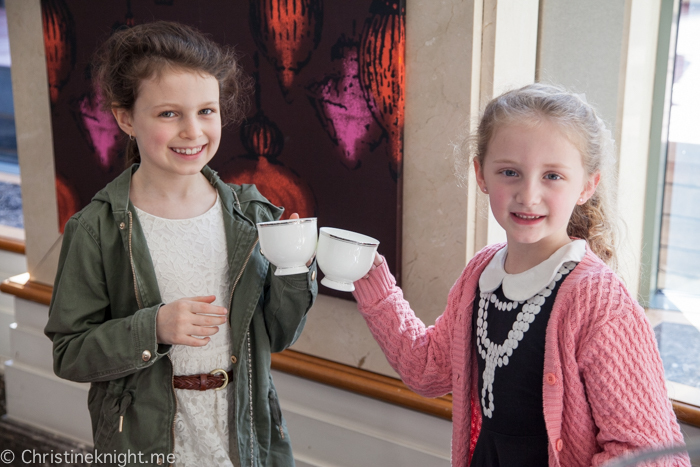 You can read about our delicious experience trying the traditional high tea here. 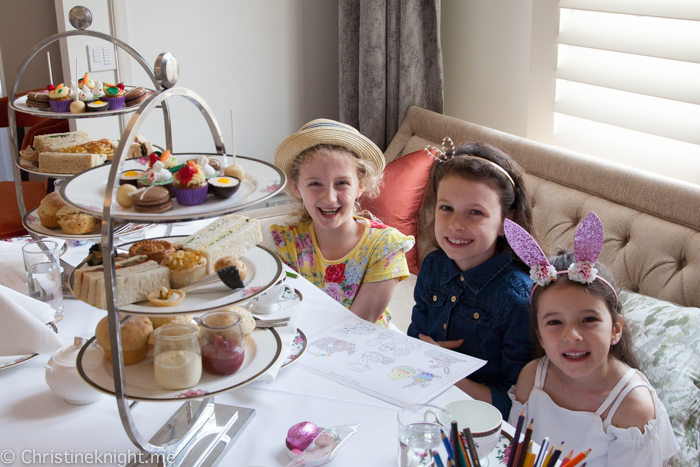 The savouries are a great kid-friendly twist on a traditional high tea. 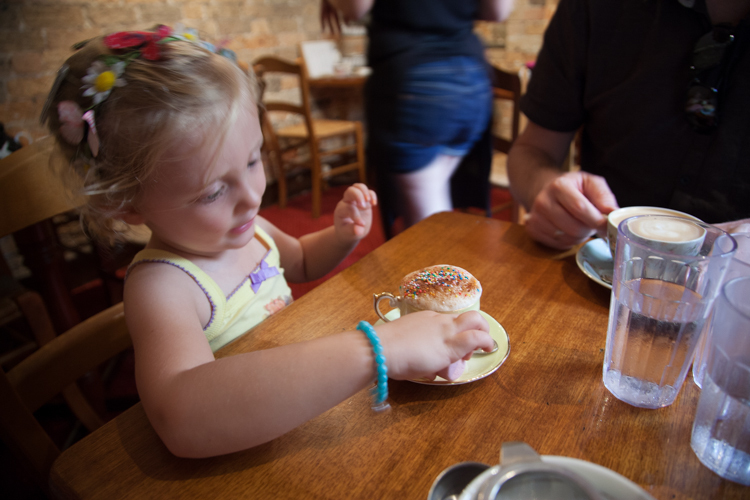 Super accessible for even the fussiest of kids to enjoy. 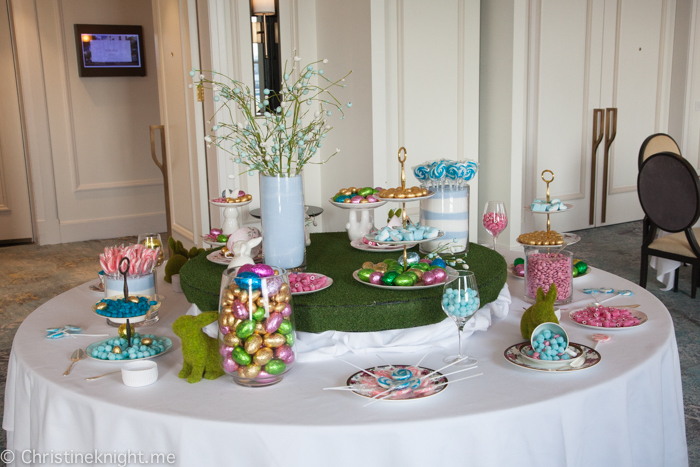 The sweet treats were a hit, both visually and also to eat. 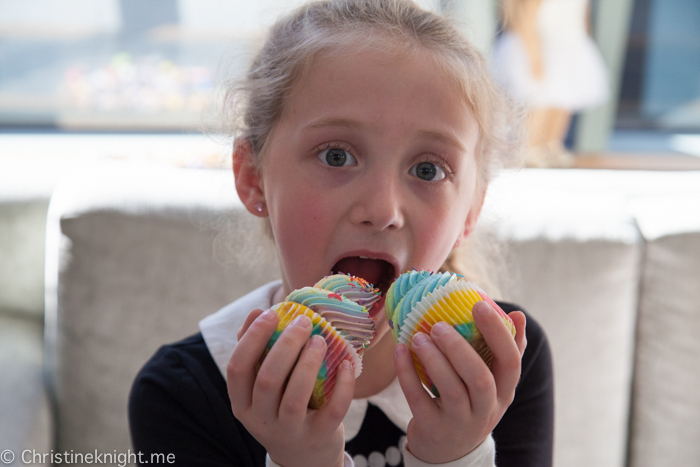 The rainbow cupcakes were the fan favourite, with the added bonus of sprinkles spilling out of the middle when they were bitten into. 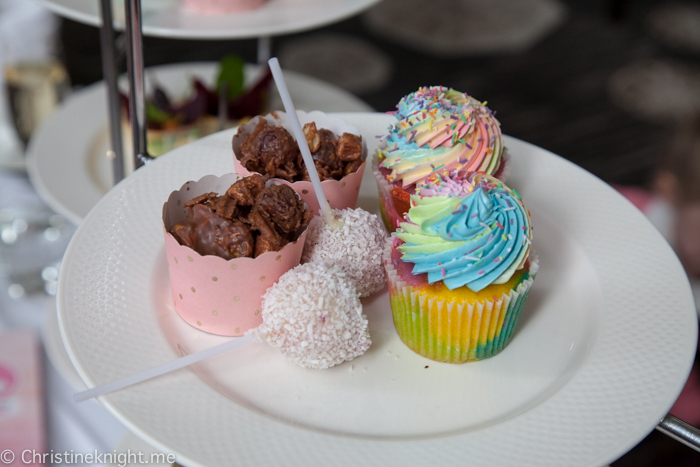 Mine and my friend’s favourite dessert was the rocky road cup – a mix of packet chips and lollies covered in chocolate, it was so nostalgic of our childhoods that we just kept going back for more. Note: the rocky road cup does contain nuts. 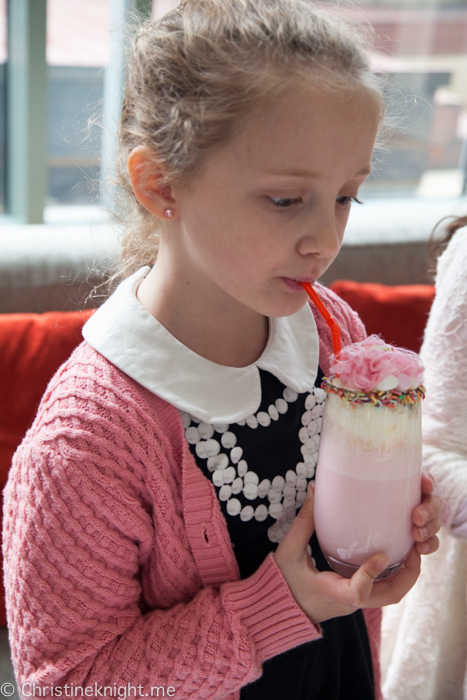 Another favourite was the Barbie shake. 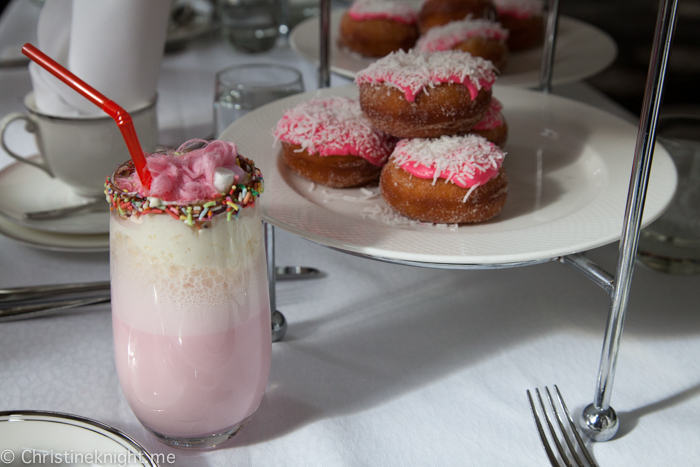 The strawberry milkshake base on its own was delectable, and with the addition of the Persian fairy floss and lollies it was just a mouth-watering treat that was devoured by all parties. 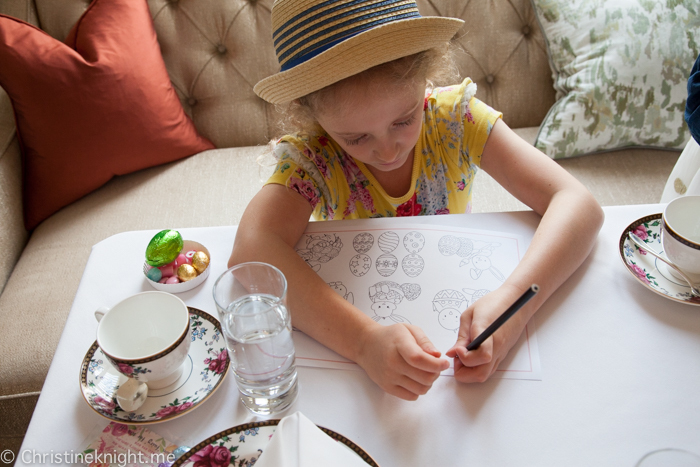 The Barbie High Tea is available from 15 June to 29 July 2018 at $45 per child. 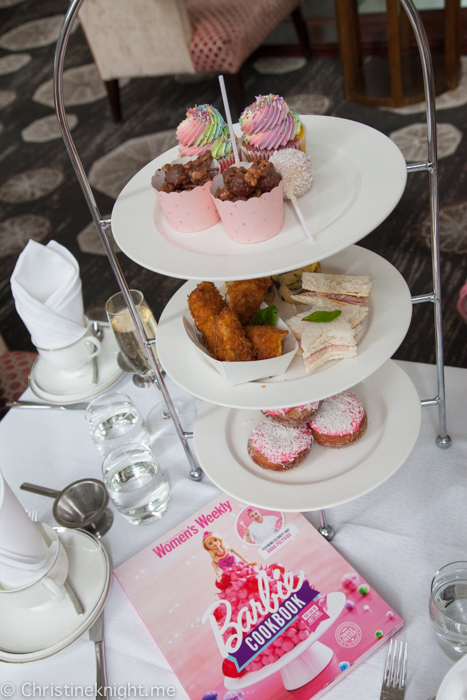 It includes a complimentary Australian Women’s Weekly Barbie Cookbook which features some of Polyviou’s Barbie inspired creations. 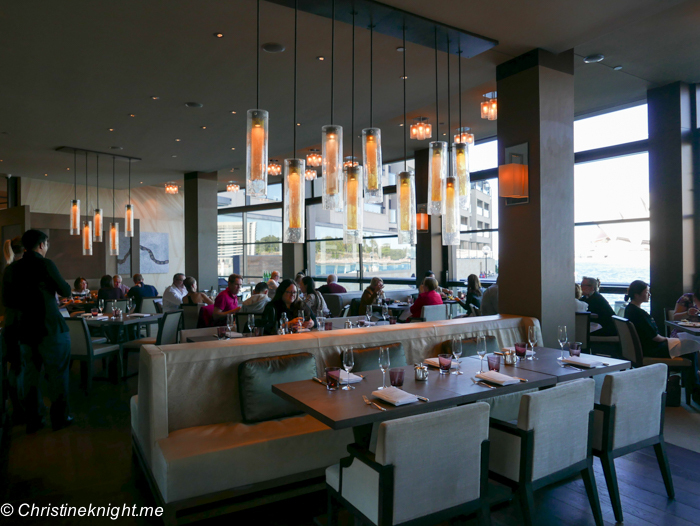 For adults, it is priced at $55 per person with a glass of sparkling and at $65 per person with a glass of Champagne. 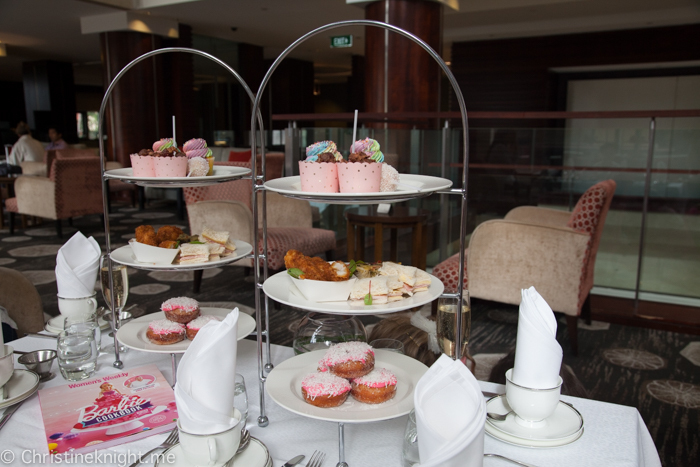 The Barbie High Tea is available daily at The Lobby Lounge, between 11:30am and 1:30pm and between 1:45 and 3:45 pm. 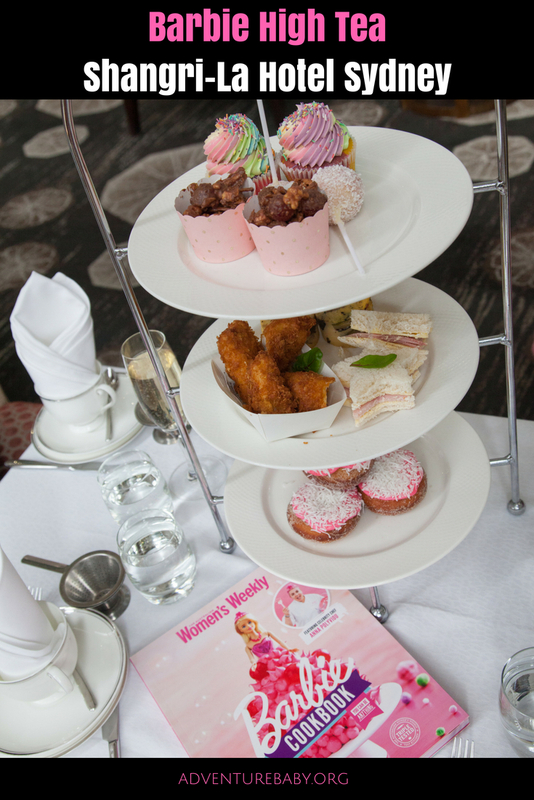 Get more information on the Barbie High Tea here. 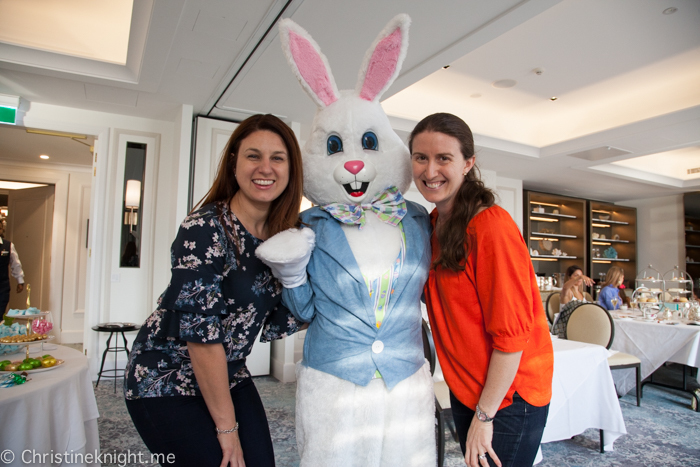 Thank you to the Shangri-La Hotel Sydney for hosting us for this very special high tea. 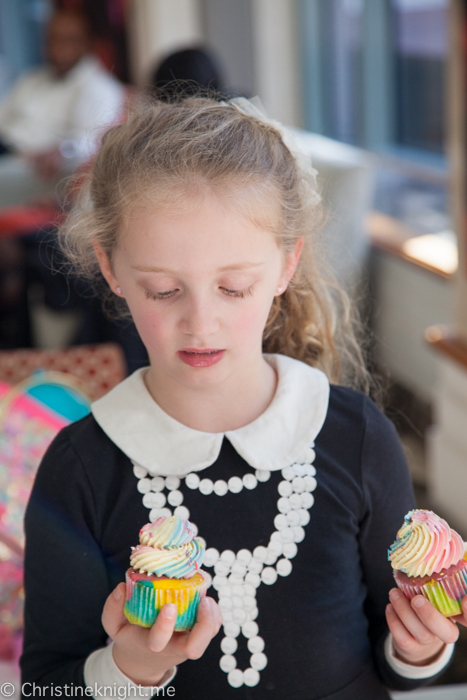 All opinions and sugar-high kids are our own. 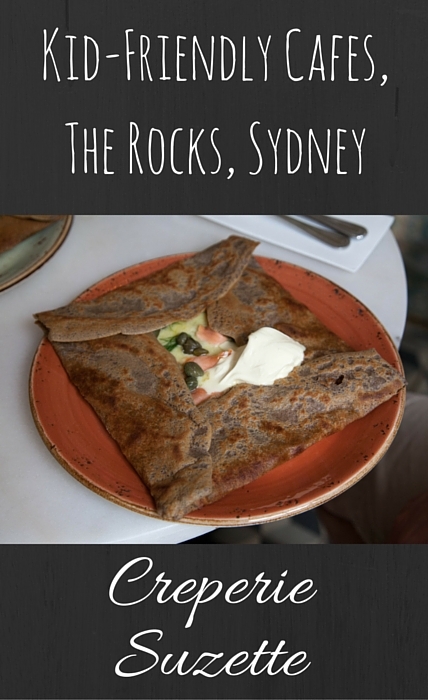 This little creperie is a tiny piece of France tucked away in the historic Rocks area of Sydney. 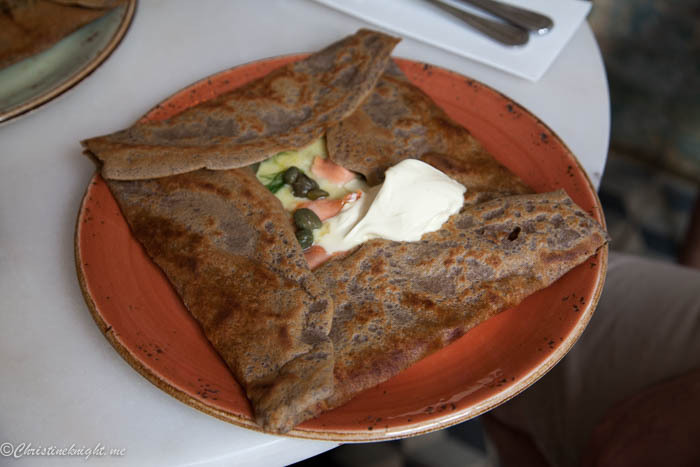 In an area chock full of tourist traps, Creperie Suzette brings a welcome touch of French soul food to the area – a welcome respite for visitors to the area who want top notch food without paying exorbitant prices. 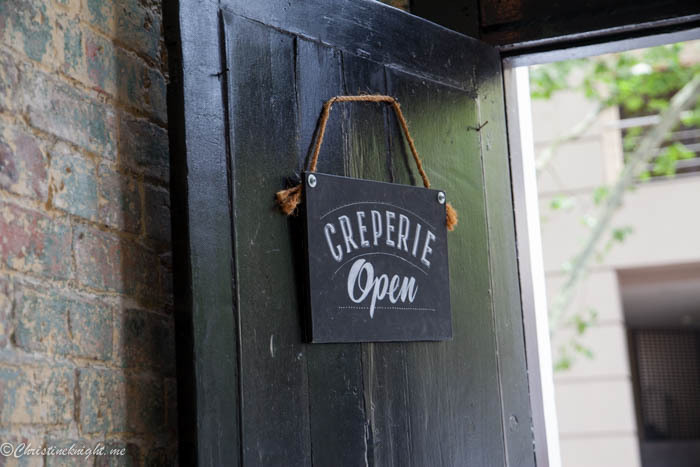 We very much enjoyed our crepes from Creperie Suzette. 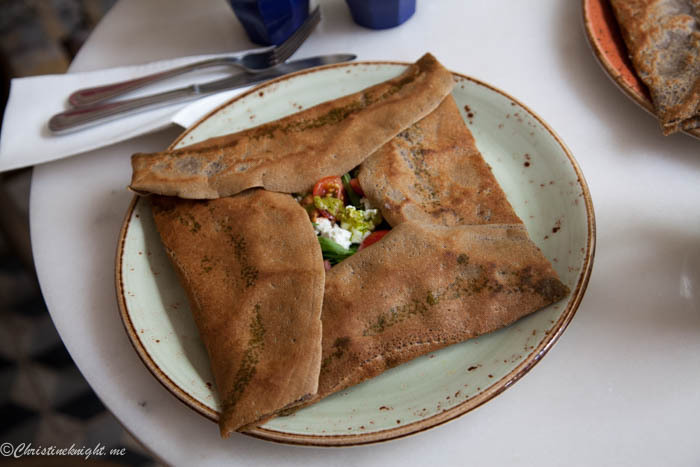 During a trip to France many years back we loved the traditional French style savoury crepes, so it was wonderful to dine on flavoursome crepes that brought back memories of such a wonderful trip to the little town of Giverny, which is where we sampled French crepes for the first time. $12), La Tasmanienne (Smocked Tasmanian Salmon, Capers, Cream Fraiche and Fresh Dill $13) and La Fraise (Fresh Strawberries, Dark Chocolate Sauce, Double Cream and Walnuts $12). 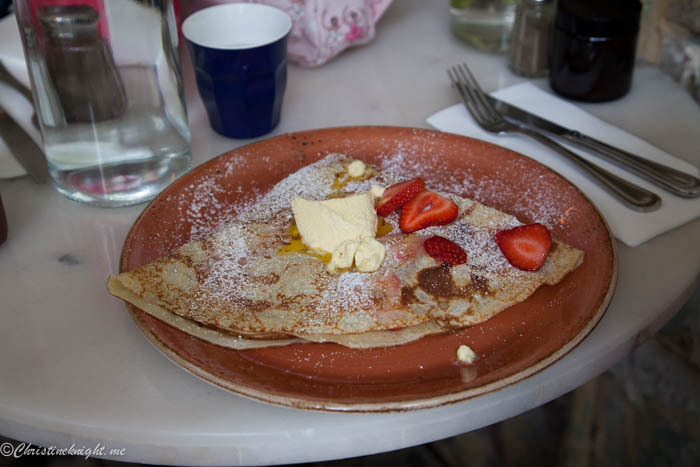 Since our strawberry crepe was for Cheese, we requested it minus the chocolaye and walnuts, and they very kindly reduced the price for us to $10, as well as custom making it very happily. 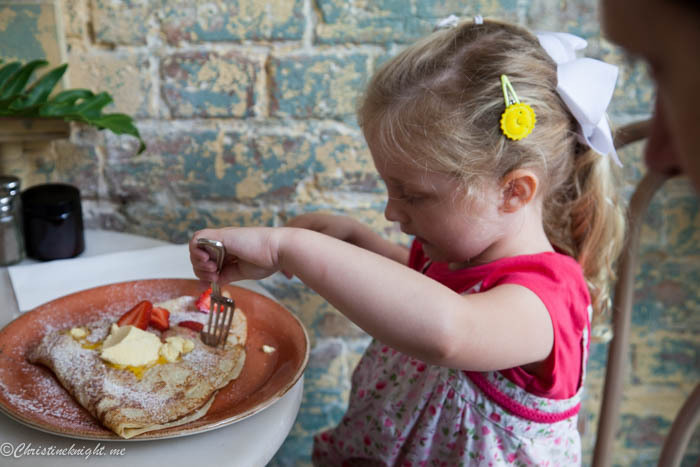 When you’re dining with small kids, it’s really appreciated when cafes are happy to make small changes to menu items to accommodate little fussy diners. 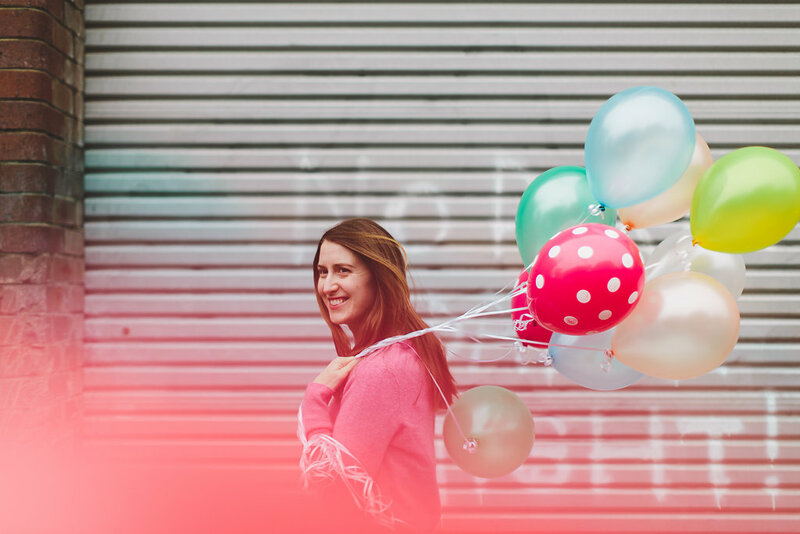 It’s tiny details like making families feel like helping them is no problem that guarantees repeat customers and word of mouth recommendations. Stroller storage: Minimal. Bring an umbrella stroller if possible. 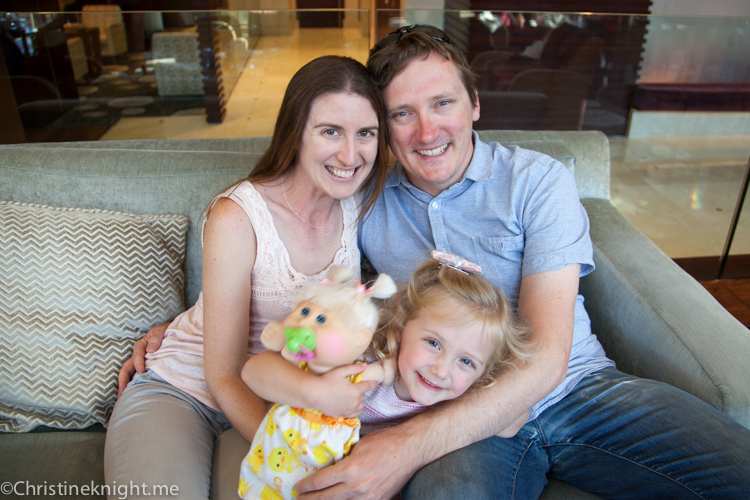 The Lobby Lounge is a relaxing venue. 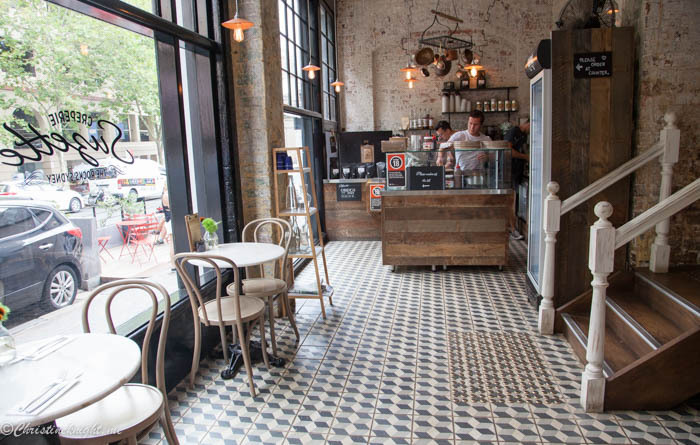 Not as posh or filled with character as many of the other tea venues, but instead very laid back and relaxed, while still being chic. 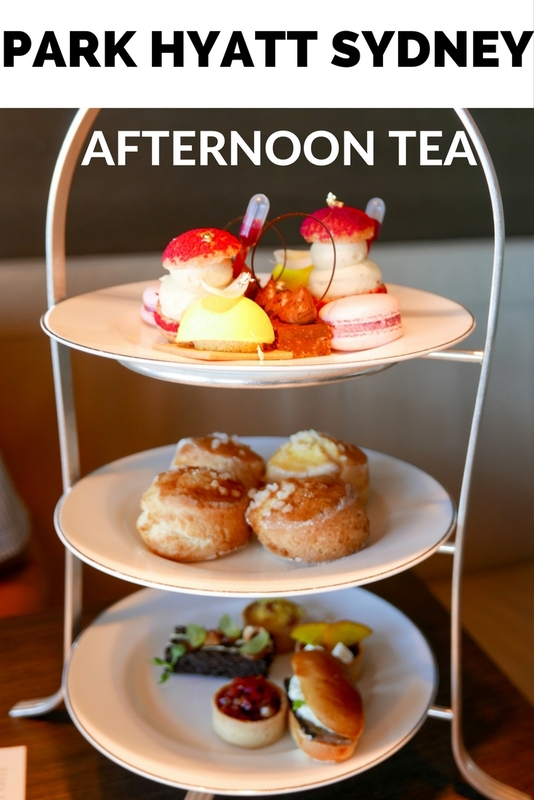 Afternoon tea here is a quiet, refined affair. 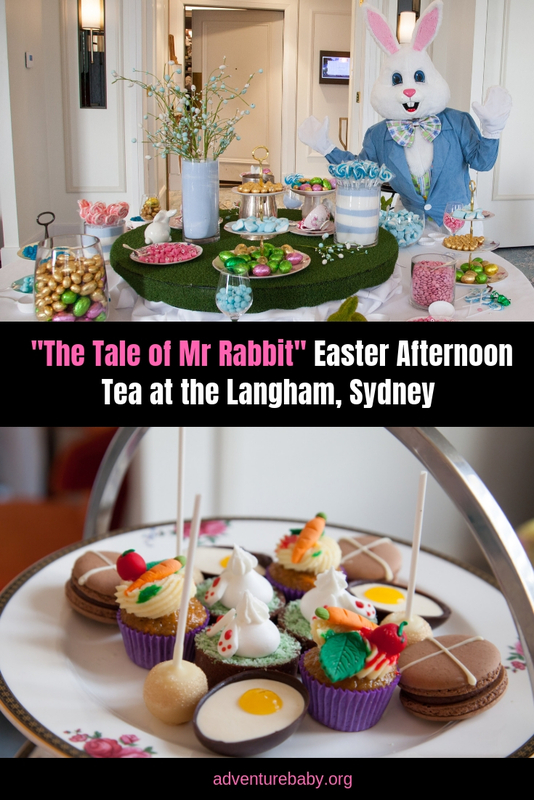 Small groups gathered to sip tea and munch on treats – more of a sedate crowd than the large groups of hens and birthdays you often see at many afternoon teas. 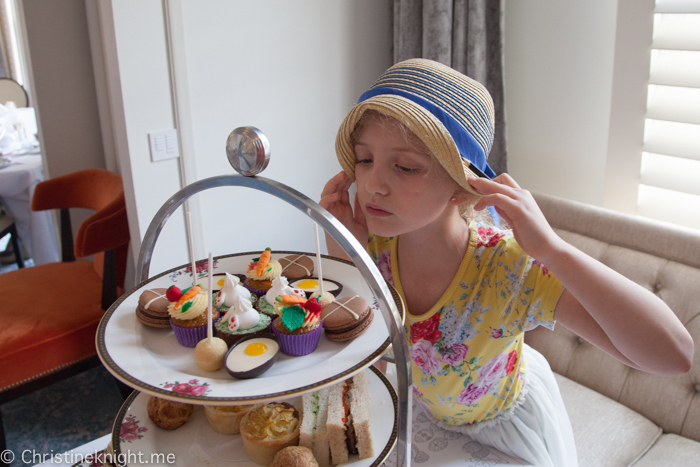 There was a bit of a mix up with our reservation and they prepared one more afternoon tea than we needed. 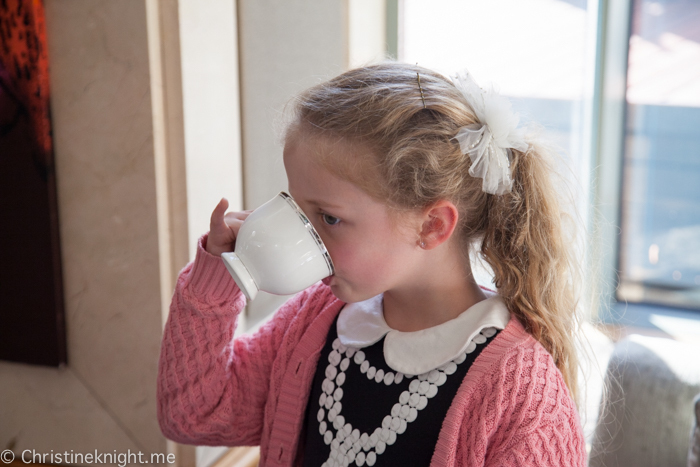 It was a bit confusing but they were extremely gracious about the mix up, and gave us the extra tea service anyway. Very kind. 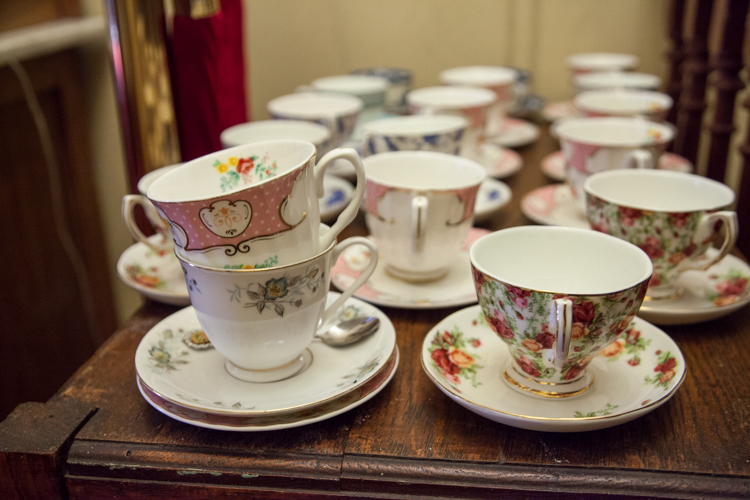 Included in the tea is your choice of tea and coffee. I believe it’s not limited to just one tea or coffee as my parents both ordered one of each and we weren’t charged for the extra pots of tea. 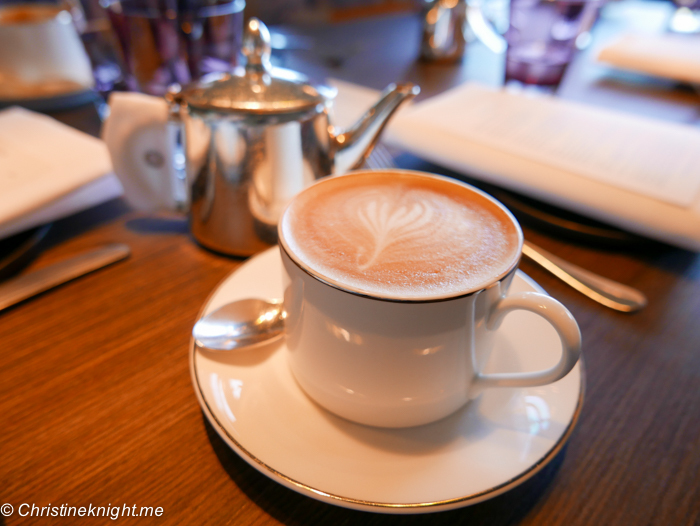 I appreciate little things like that, it makes the tea feel like good value rather than getting the bill and finding unexpected charges having added up. 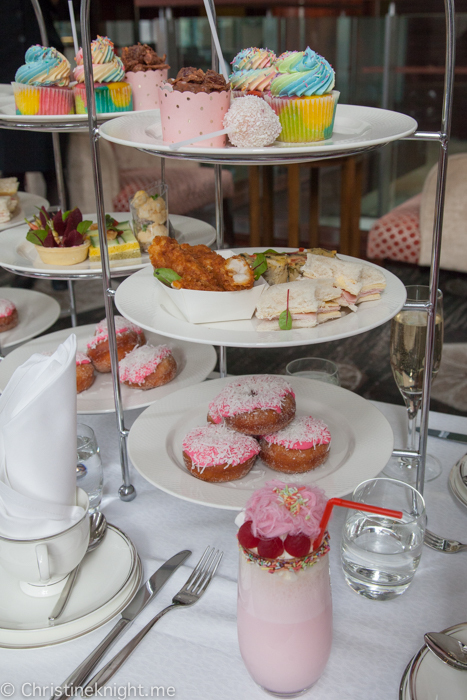 Our afternoon teas arrived on large platters, very impressively displayed. 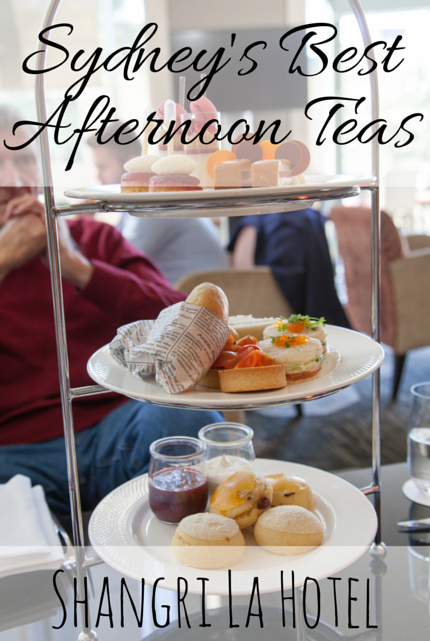 My dad has some dietary requirements which they were more than happy to accomodate with zero fuss, and my afternoon tea was vegetarian – exactly the same as the Traditional Tea except for the sandwiches. 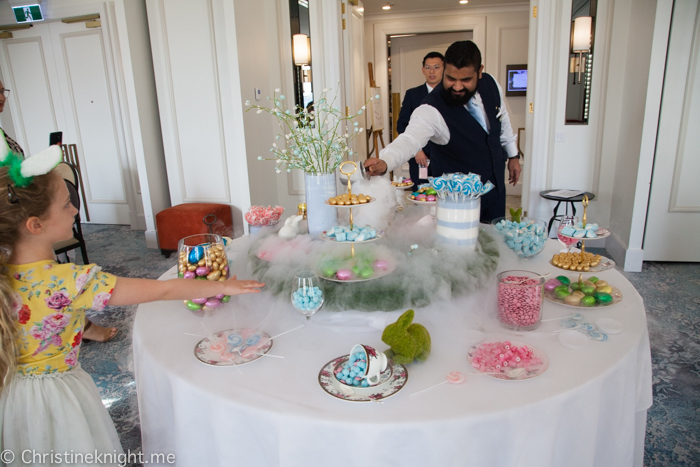 One of the main reasons I was so keen to try this afternoon tea is because I wanted to sample delights from the hand of renowned pastry chef, Anna Polyviou. I have to say, they did not disappoint. 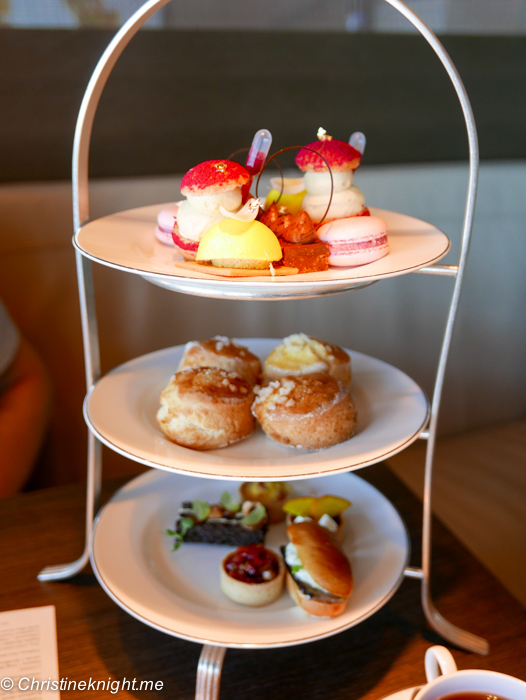 The afternoon tea is served in 3 layers. 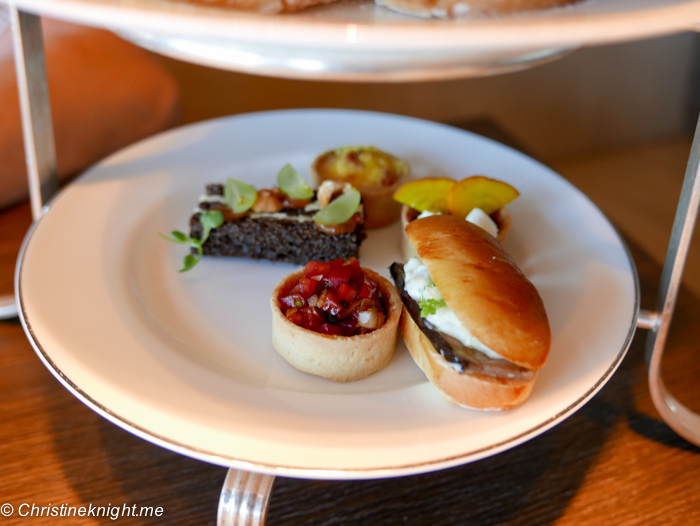 Sweet on top, savoury in the middle, scones on the bottom. Tropic-Anna: Coconut dacquise, white chocolate disc, coconut and Malibu crème, tropical fruit compote, popping mango pearls, baby coriander. This was one of my favourites. 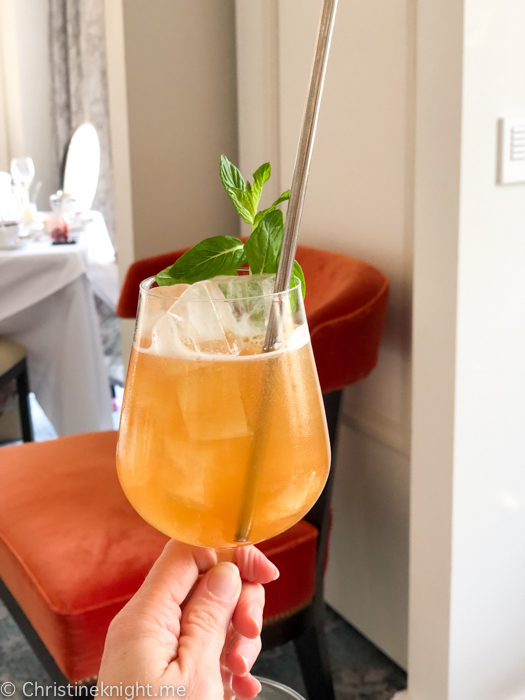 Light, citrusy with a hint of coconut. Amazing. Carrot cake: Carrot cake rice bubble and hazelnut crunch layer, Apricot and carrot insert jelly, praline cremeux, caramel glaze, and yellow graffiti. 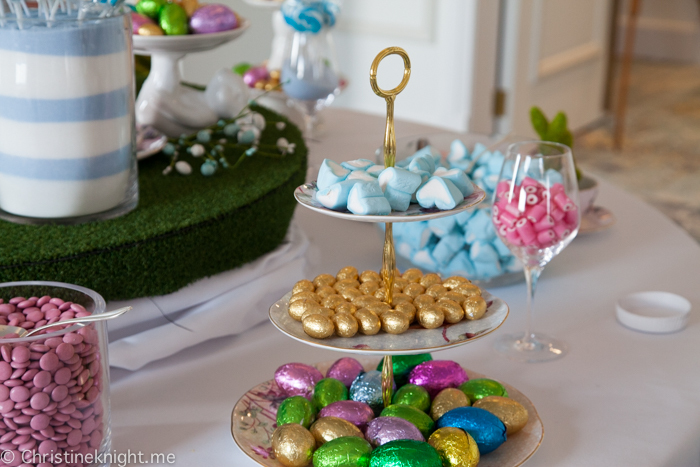 Finished off with orange and milk chocolate discs. 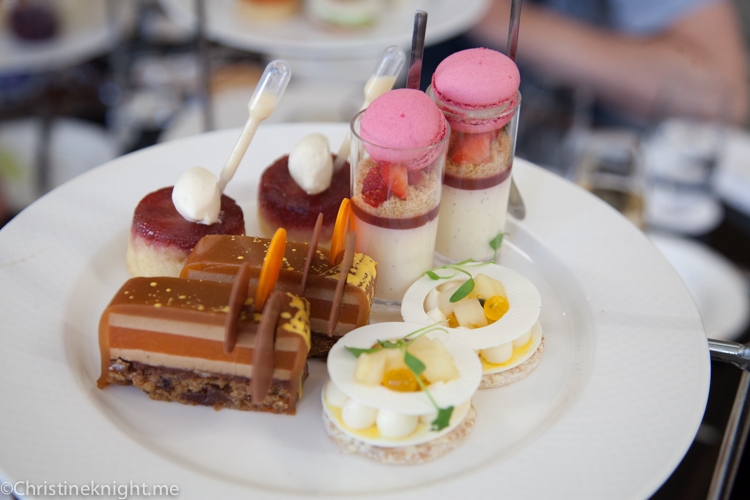 This is a dessert Polyviou is well known for, but as I’m not the biggest fan of carrot cake, I enjoyed the others more. Rhubarb and Ginger Pudding: Rhubarb and ginger cake, whipped cream baby celery on top, custard sauce. My other favourite. Simple and so delicious. Berry Me: Vanilla panna cotta, raspberry jelly, biscuit crumbs, mixed berries, meringue kisses, yoghurt and strawberry macaron, baby basil. 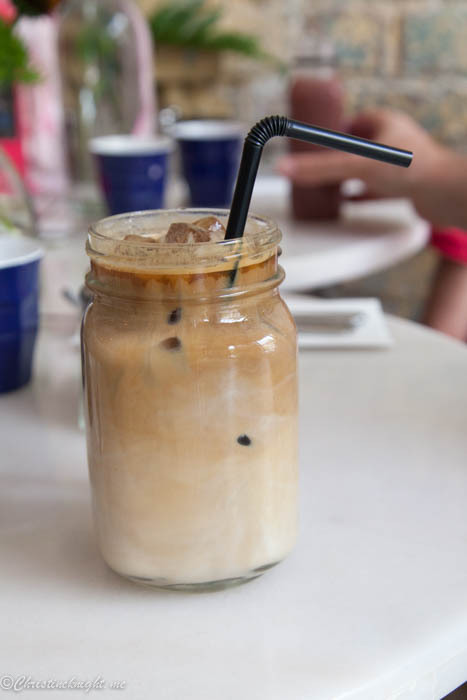 A very delicious, creamy affair. Tart: Caramelised onion, goats cheese, tomato and baby basil salad. Delicious! The basil salad was unexpectedly cooked inside and was delicious. 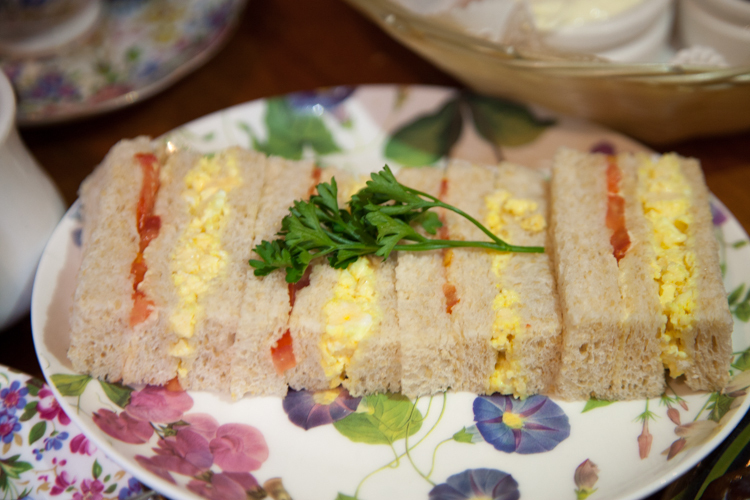 Traditional Sandwiches: Roast pork, Vietnamese salad roll; Chicken and celery sandwich; Salmon, cucumber and cream cheese, salmon roe, sandwich. 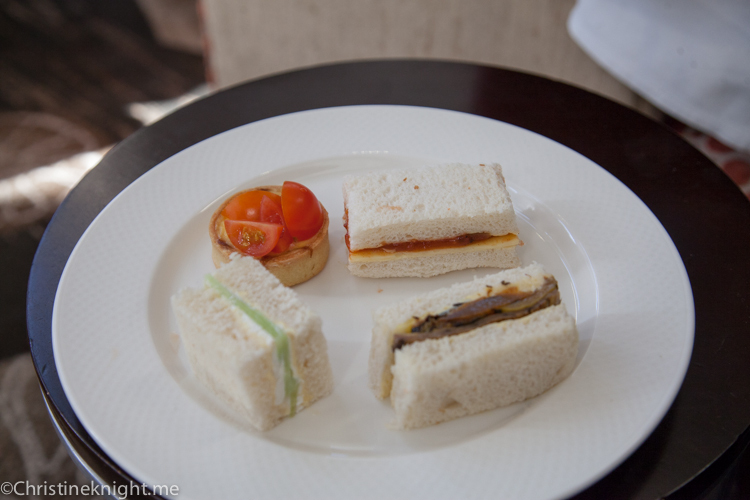 I had vegetarian sandwiches instead. I’m not sure exactly what was in them, but they were light, with very fluffy, fresh bread, and light, tasty ingredients like sweet potato, cheese and cucumber. Really good. 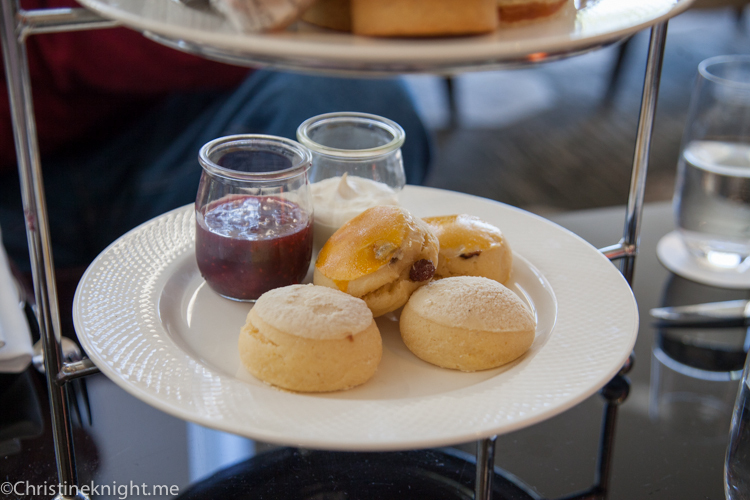 Buttermilk and vanilla scones, Buttermilk and tea raisin scones, Clotted cream, Mixed berry jam. 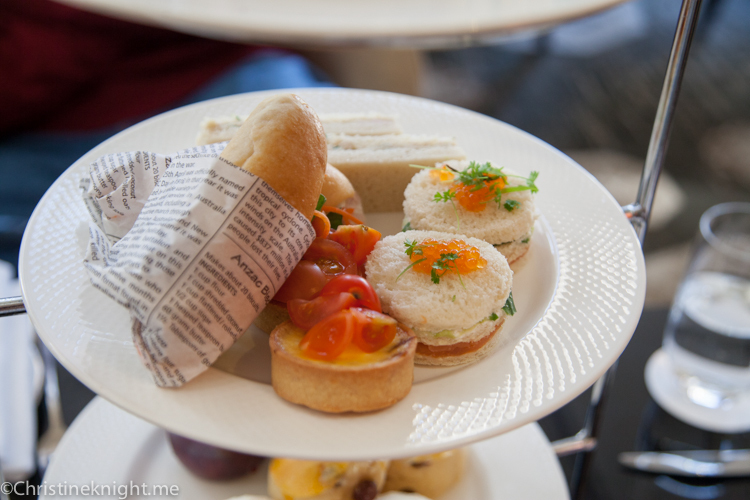 The scones were on the flat side, small and dense, rather than the large fluffy ones you often get in high teas. 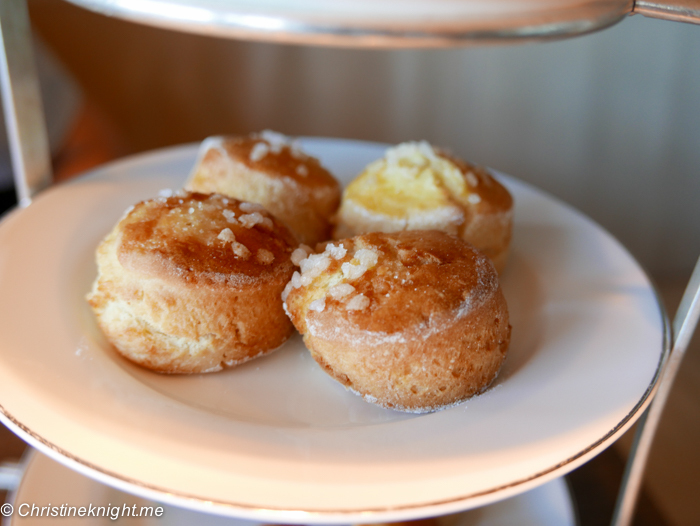 They still tasted great, but were more like an American biscuit than a traditional English scone. 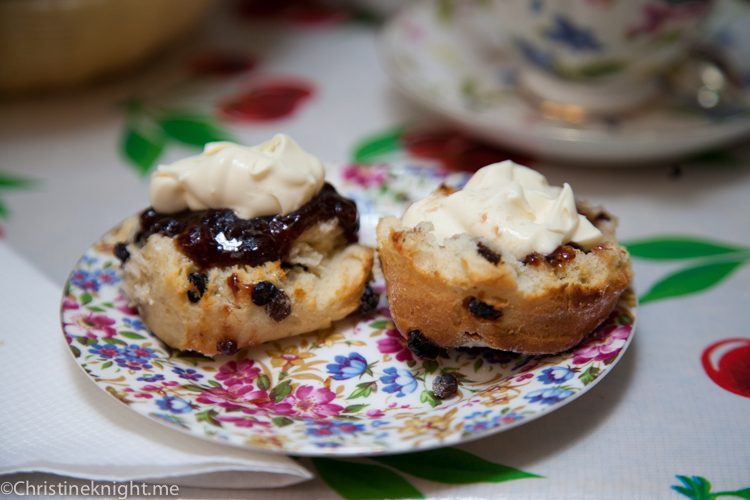 The jam was flavourful but a bit on the runny side, and the cream was thickly whipped. 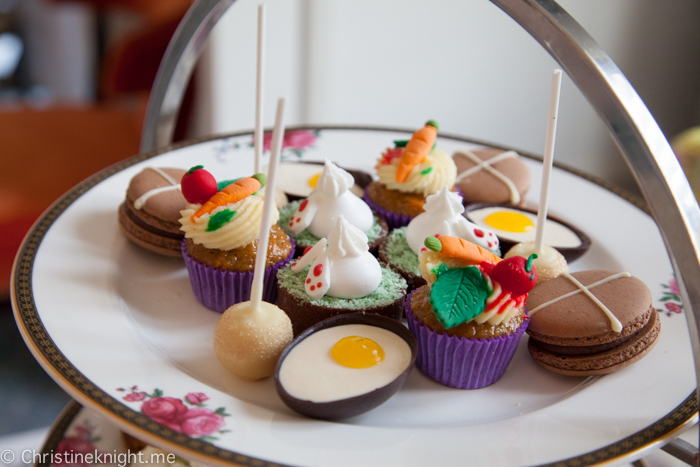 I highly enjoyed the Traditional Afternoon Tea – in particular the surprising, innovative desserts. 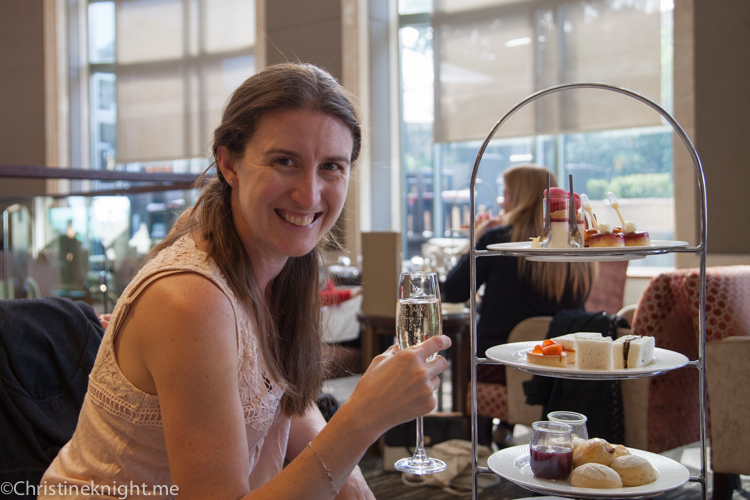 I will absolutely be back to try the Wickedly Chocolate Afternoon Tea next time. 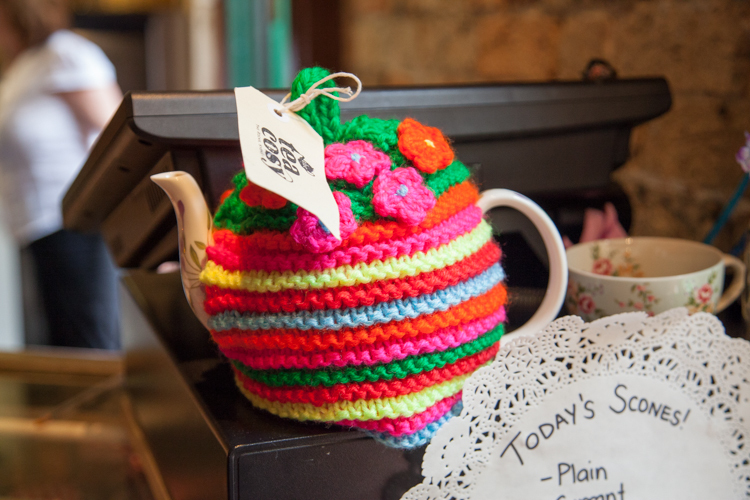 I’ve written about how I love The Tea Cosy before. 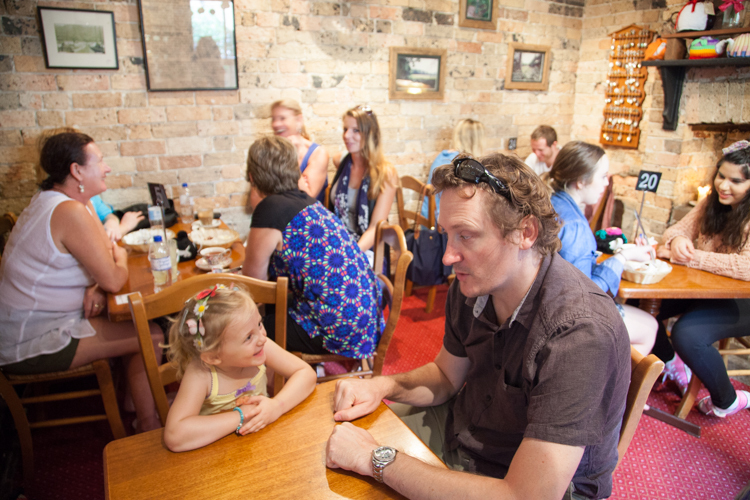 This adorable, family-owned cafe is tucked down in The Rocks. 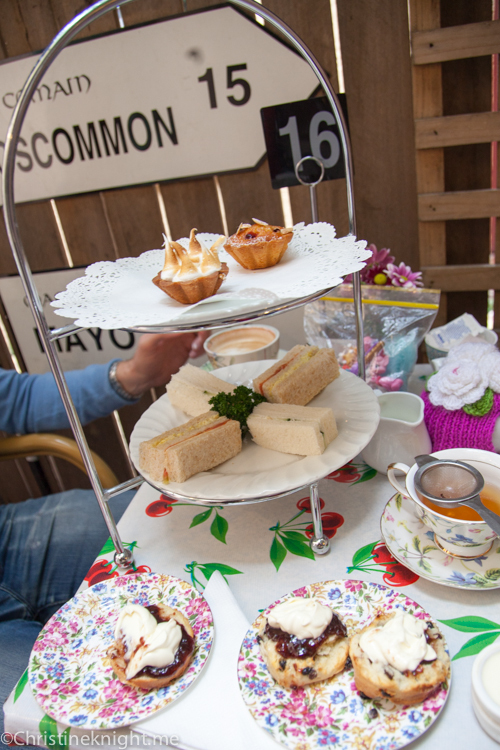 It’s well worth a visit for a quick scone and tea, or a larger afternoon tea like I had on this occasion. Alec once again had the Ploughman’s Lunch ($15). 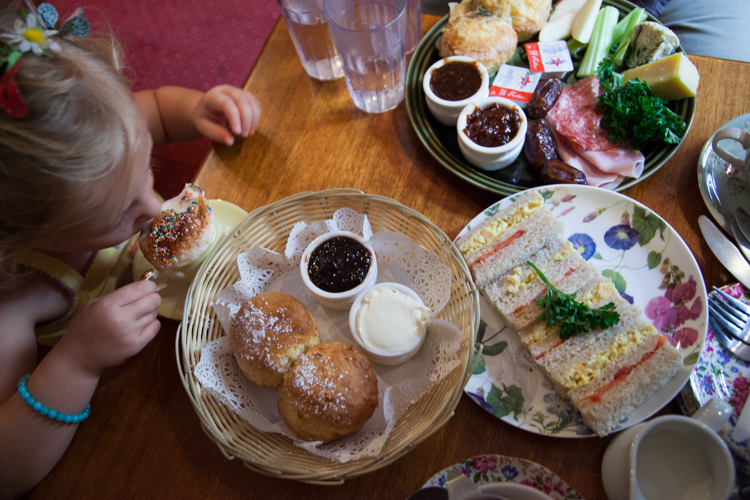 We ordered Cheese the Kid’s Devonshire tea ($7, one plain scone, jam & cream and a babyccino) and I enjoyed the High Tea ($35 pp: sandwiches, 2 scones, 2 drinks and cakes). 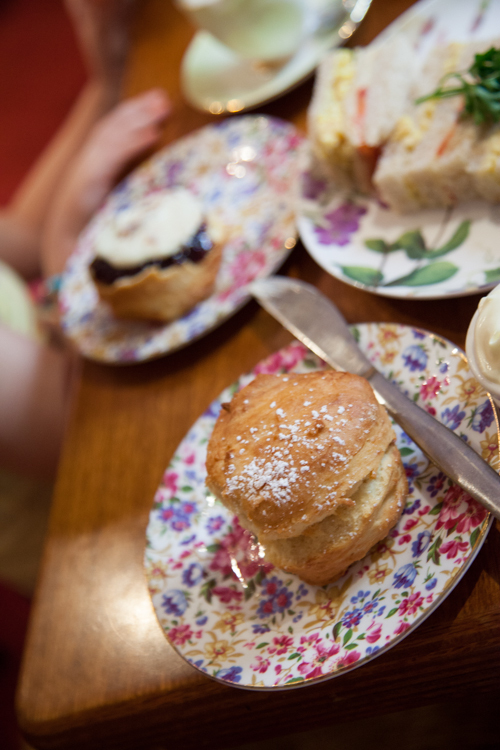 The scones at The Tea Cosy are always the star of the meal. 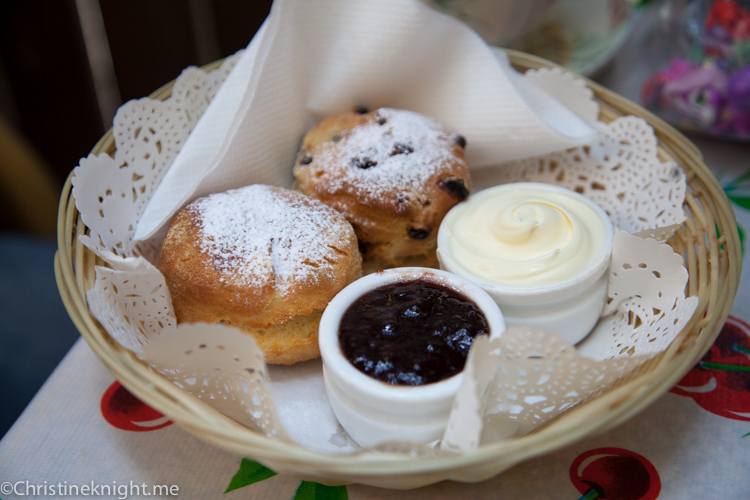 I think they are baked fresh all day, so the ones we had were the freshest scones I’ve ever had. 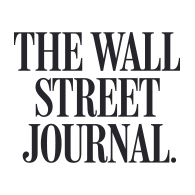 The jam is sensational – such a big flavour in a tiny bite of jam. 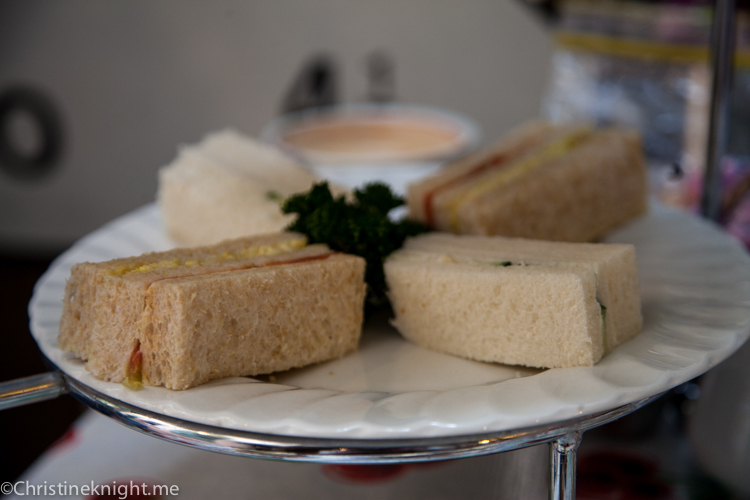 I also loved the sandwiches – the bread was so fluffy and fresh that it almost melted in my mouth. 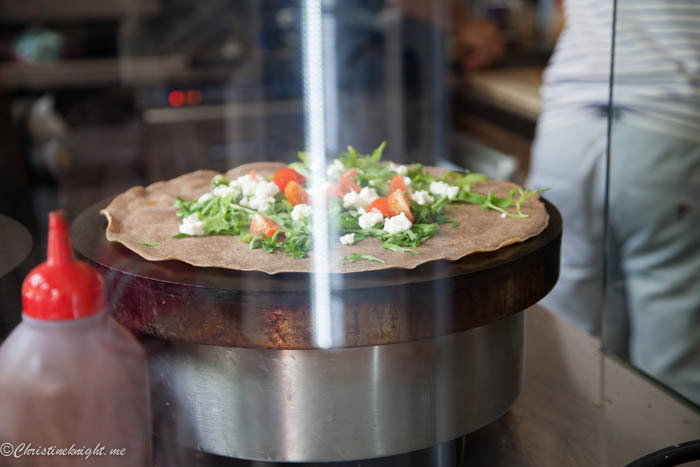 The toppings were great – cream cheese and cucumber and curried egg. 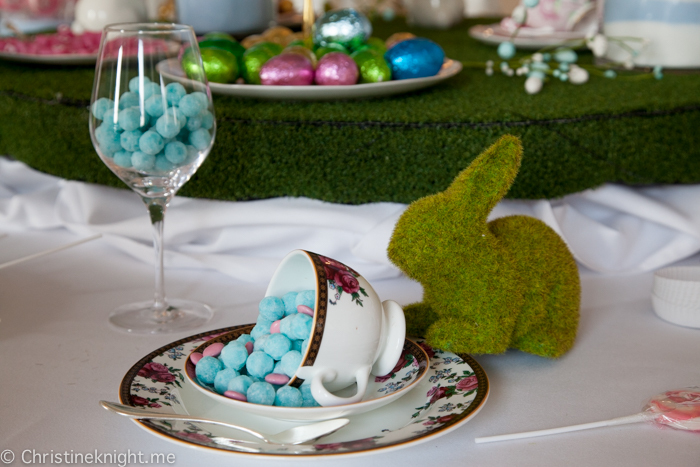 The egg was my favourite and I could have eaten even more. 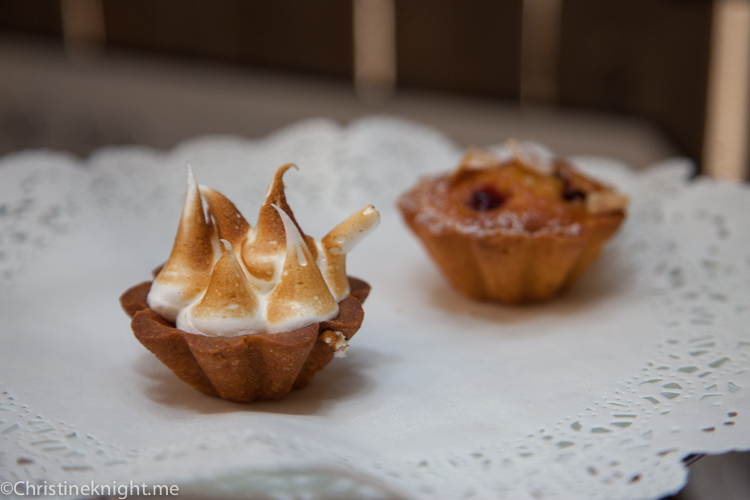 The desserts were very simple – one lemon meringue tart and a berry friand muffin type of thing. 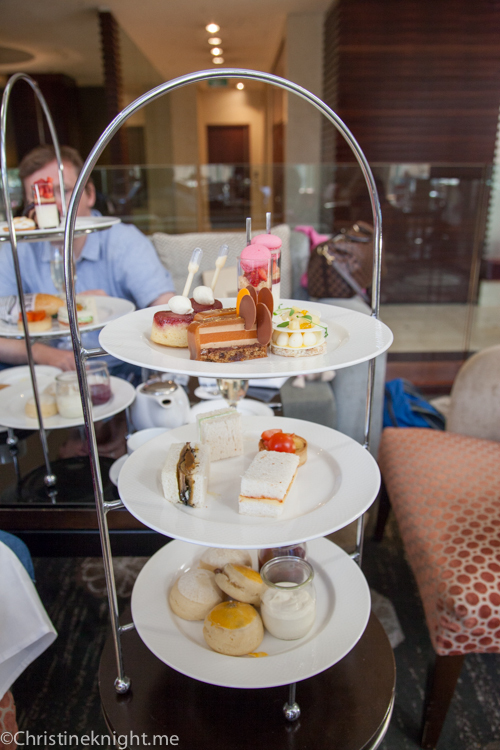 I really liked having just the two pastries as I often find high teas a bit too sweet when they have the large tray of desserts. 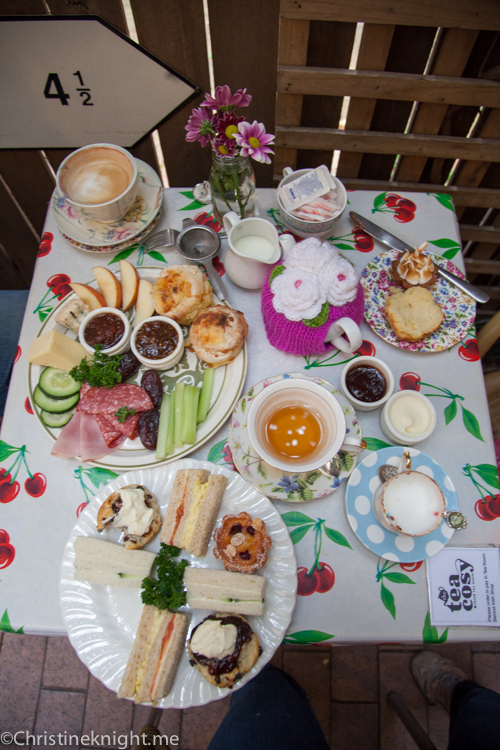 I must prefer to have more sandwiches and scones and only a few sweet things at the end. 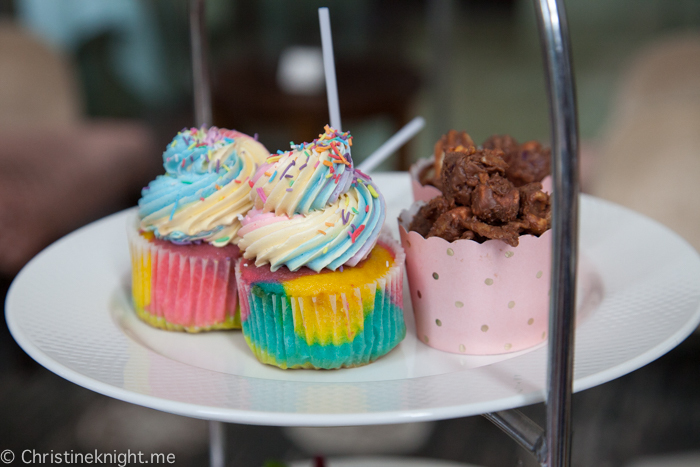 So this was basically my perfect high tea. 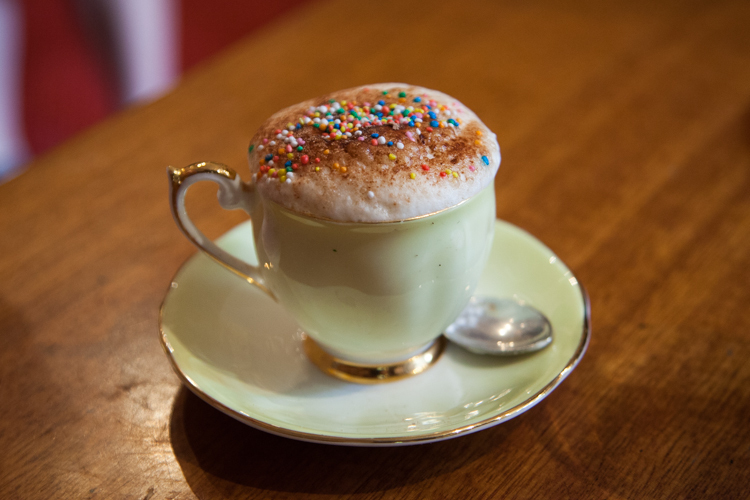 Cheese loved her fancy babyccino (it came with two marshmallows – one was eaten before I could snap the picture) and scone. 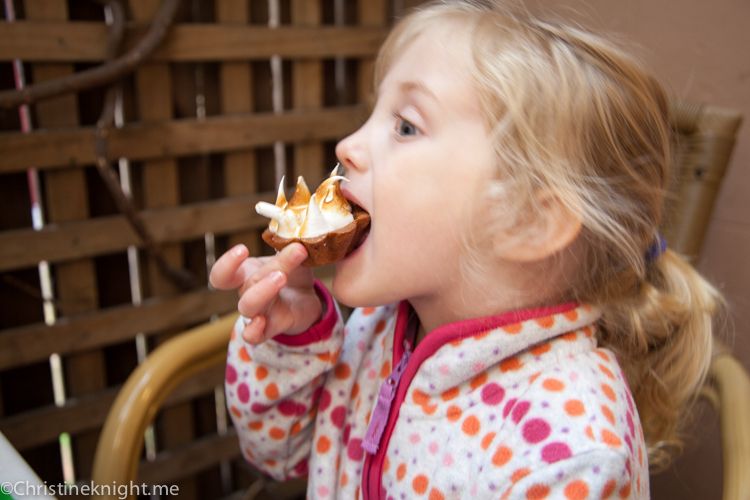 She even ate it with jam this time. 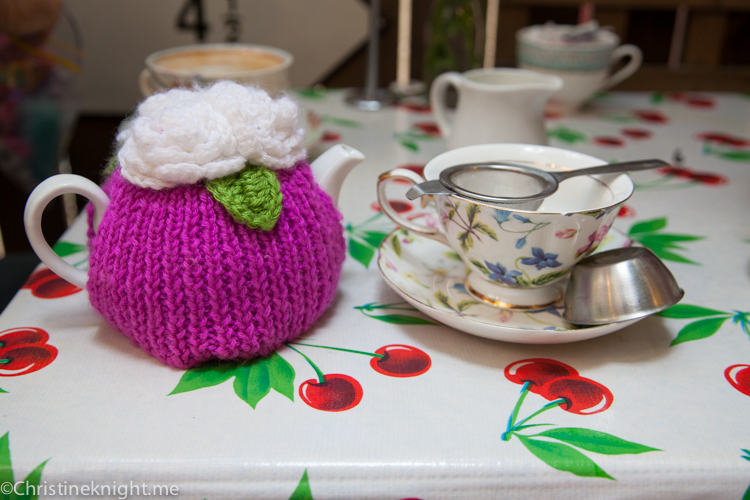 I love The Tea Cosy and always want an excuse to get back down to The Rocks so I can indulge in more scones, yet again. Stroller storage: Minimal – it’s a very small space. 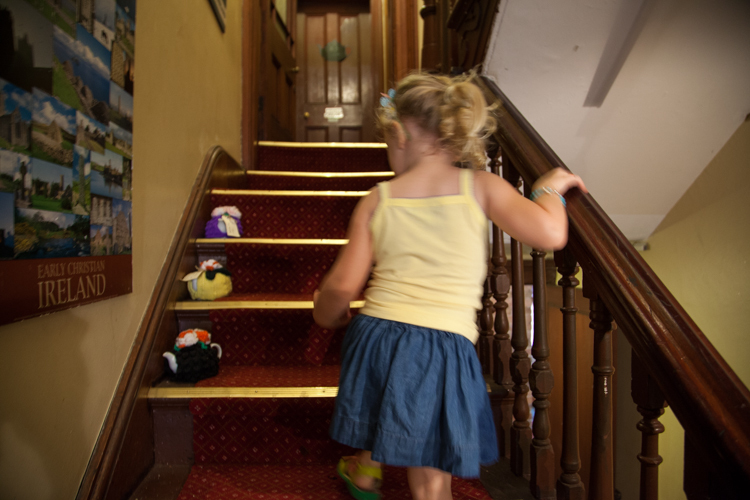 Easy access: Small steps in, narrow corridors. 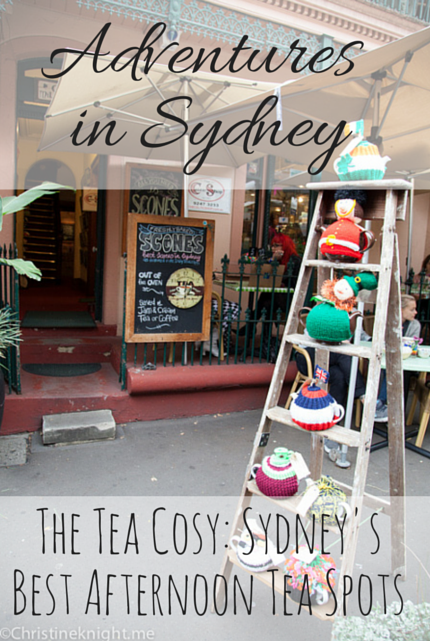 In the heart of The Rocks lies one of your best bets for traditional scones in Sydney. 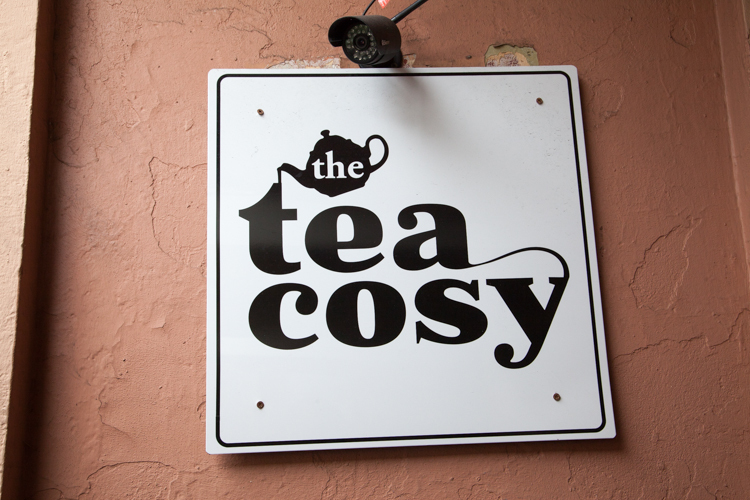 The tiny and adorably named The Tea Cosy is an Irish-Australian family-run business, housed in a stunning 1870s heritage-listed building. 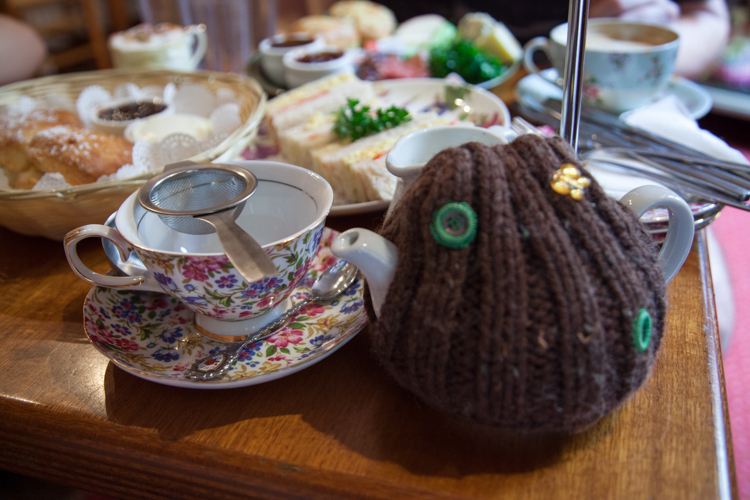 If you’re serious about scones and tea – and also love a fancy tea cosy – then this is an outing for you. 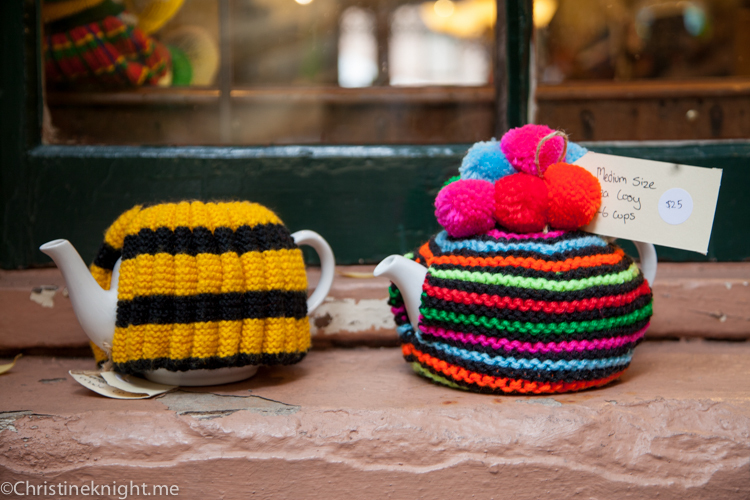 The Tea Cosy is small and very popular. Blink and you’ll miss the small sign the wall near the entrance to the Irish Shop (that they also own and run), letting you know that you have indeed reached scone nirvana. 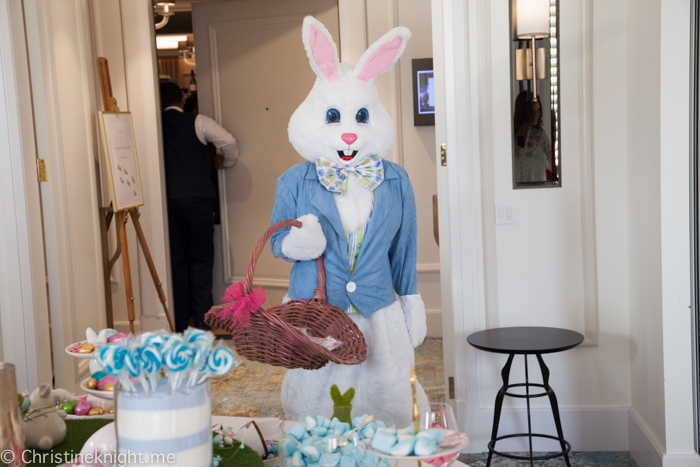 Walk through the narrow hallway to the back and find any table you can – or stand around and wait till someone leaves and then grab their table fast. 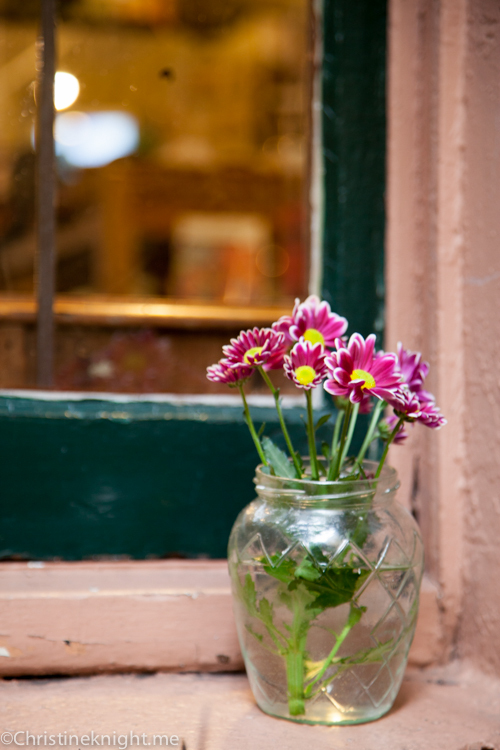 We had a short wait when we arrived on a rainy gloomy Saturday, but very happily found a little corner in which to squeeze. Our order overflowed from our little table. 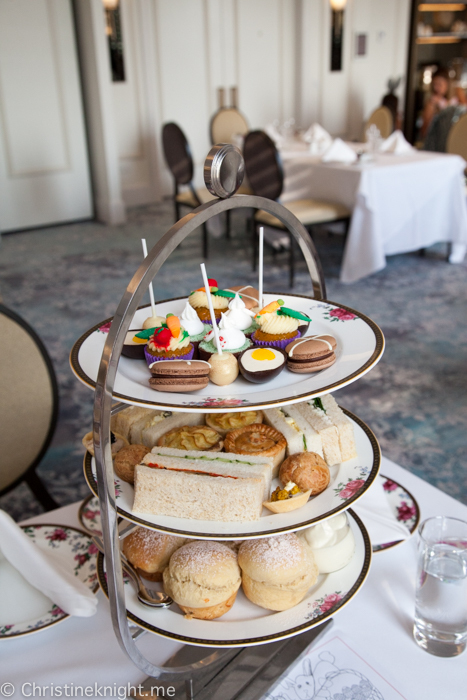 Devonshire Tea (Scone Basket) $14 per person, includes your choice of drink (I chose chocolate and vanilla tea), scones and jam (I chose Raspberry), Babyccino, Ploughman’s Lunch ($15), Ribbon Sandwiches in curried egg and tomato ($9.50). 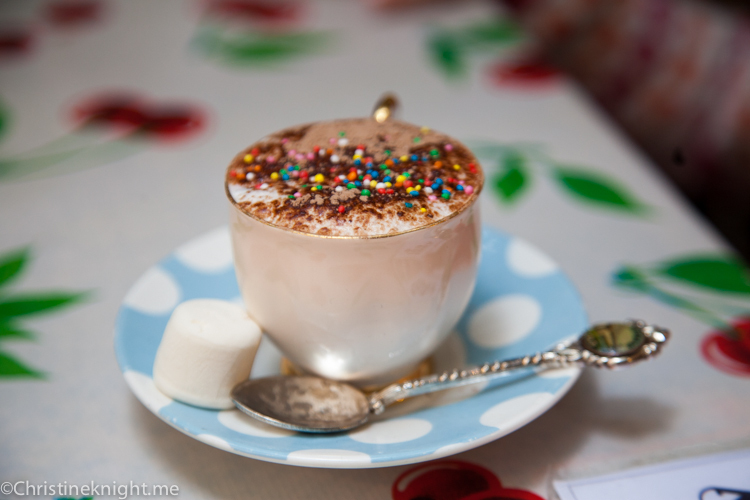 The Babyccino actually came with TWO marshmallows, both of which were nabbed before I could get a shot. 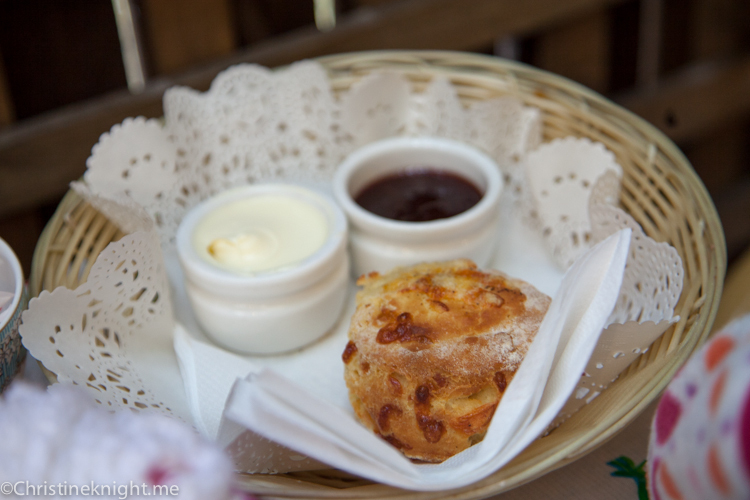 I shared the scones with Cheese, who insisted that hers was also topped with the amazing raspberry jam and cream. 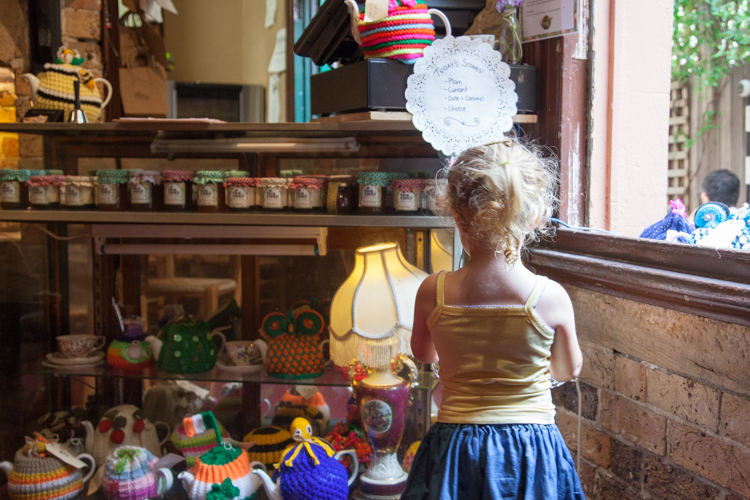 Alec loved the jam so much he bought a jar to take home. 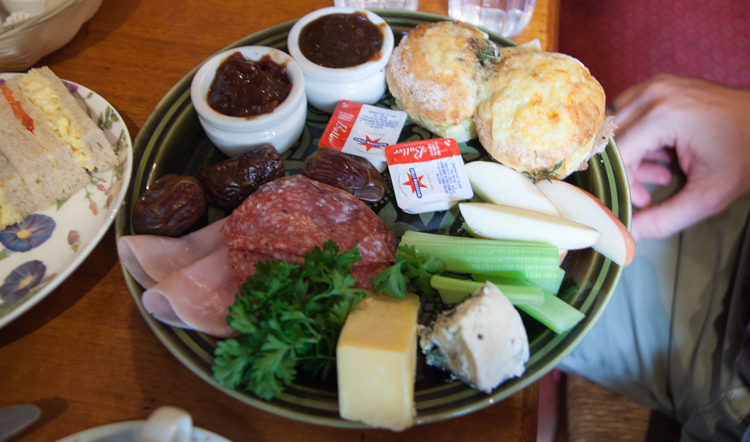 His ploughman’s platter was light and yet filling – as described, it is indeed the perfect traditional lunch (for those who like meat). 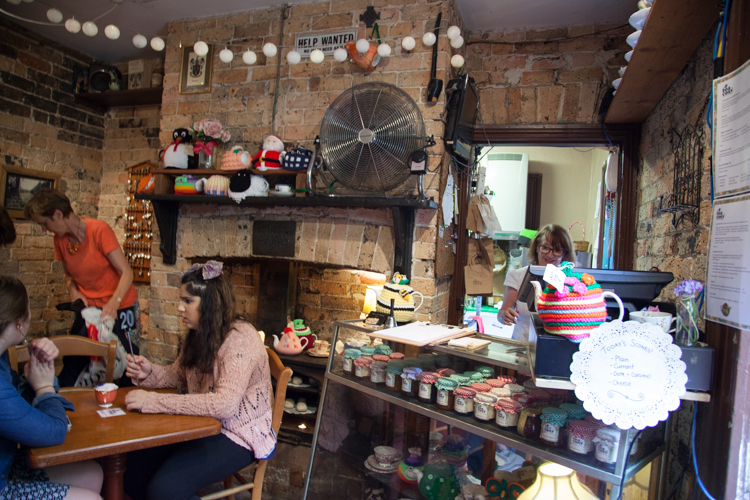 All of the scones at The Tea Cosy are made by hand from scratch, using an old fashioned family recipe. 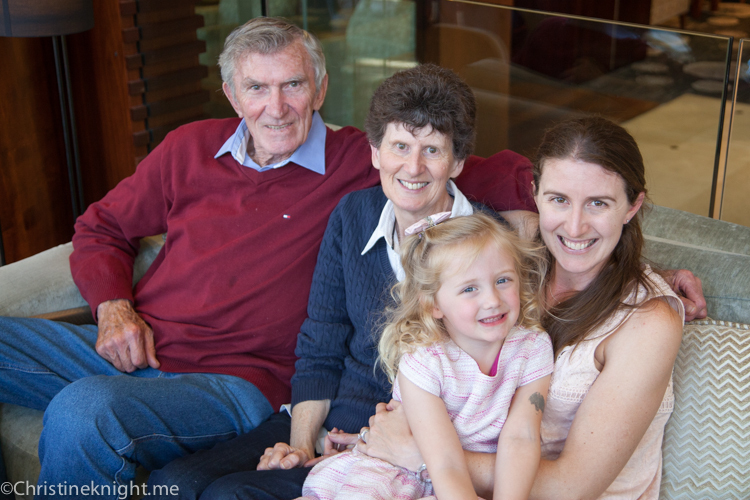 Their jams are Australian-made gourmet jams, and the cream is double thick. The food was so good, I honestly couldn’t fault a thing. 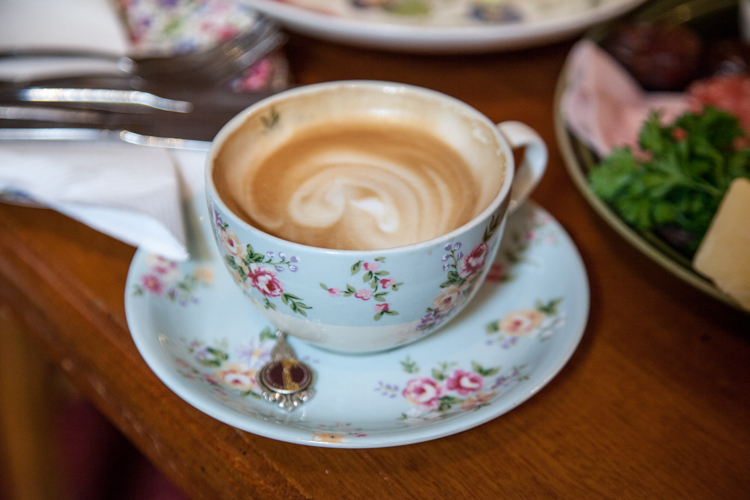 The staff were really lovely – it’s really obvious that this is a family-run business as the people who run the joint really care about their customers and ensuring that they have a great experience. 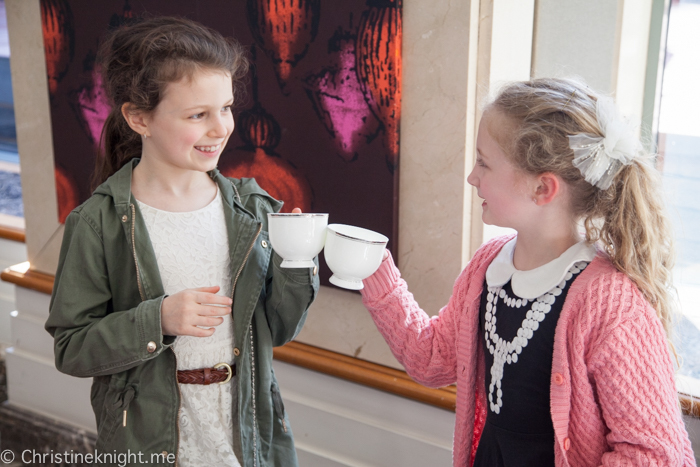 They’re also really friendly and chatty, which is also a nice experience in itself. 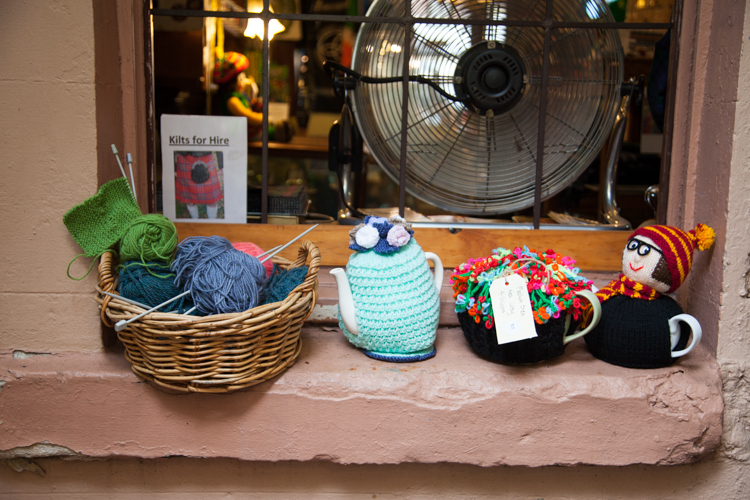 A little stroll around The Tea Cosy reveals many, many, many tea cosies. 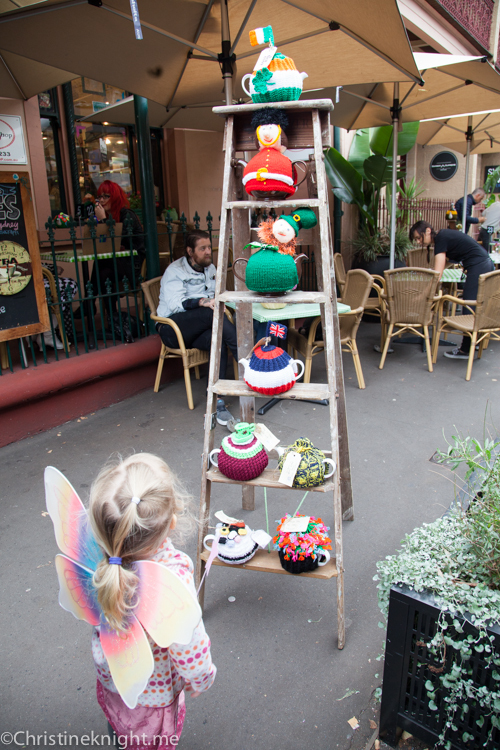 These can be bought for very reasonable prices (I saw labels for around $25 – $35). As each looks handmade and unique, that sounds like a pretty good deal to me.